April | 2018 | H.A.W.K.S. 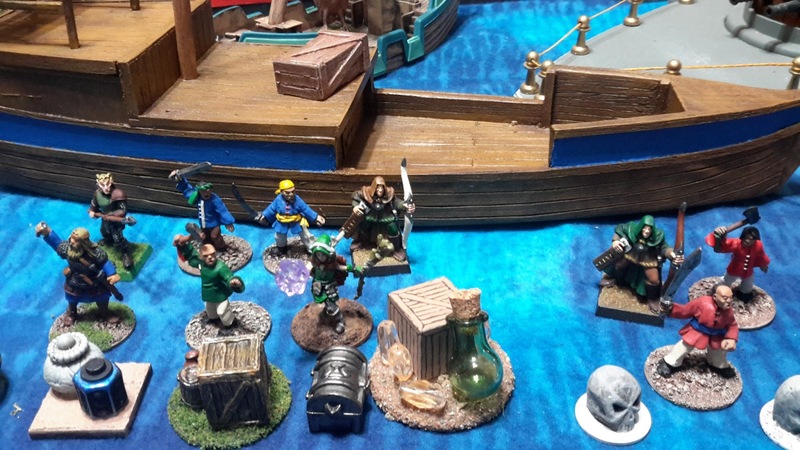 My gaming group completed Game 4 of our 2018 Ghost Archipelago Campaign – The Floating Hulks. 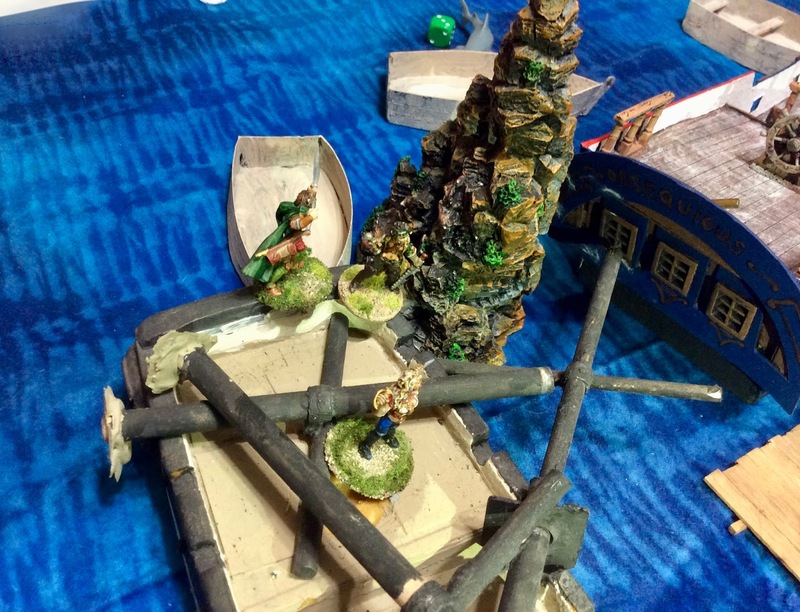 We modified a solo scenario titled “The Floating Hulk” written by Joe McCullough (author of Ghost Archipelago) and published in the November 2107 issue of Wargames Illustrated. 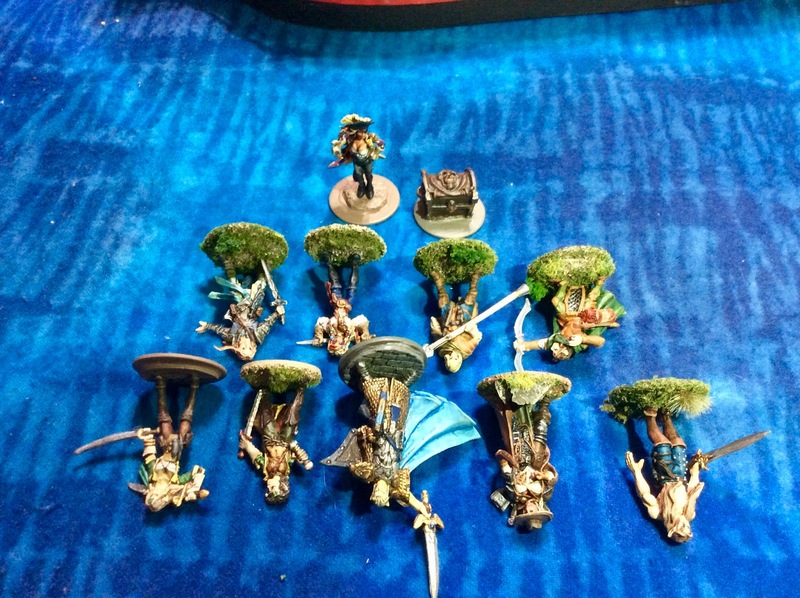 For the game we had six of our regular players, two players being unable to attend. Skorri was lucky in being second in selecting his starting location. A corner position was picked to protect one of his flanks from the other Heritors. In the end, he ended up facing Fortrywn directly across from him, Kragmar to his immediate right, and Molly Malone to his right front. Further down the table were Herndon and his arch-enemy Griffin. Looking out from the bow of his ship, Raven’s Beak, Skorri Drakenberg scanned the horizon. His thoughts flashed back to the activities of the past couple weeks. After recovering from his encounter with the Heritor Griffin, Skorri had to conduct a bit of recruiting. 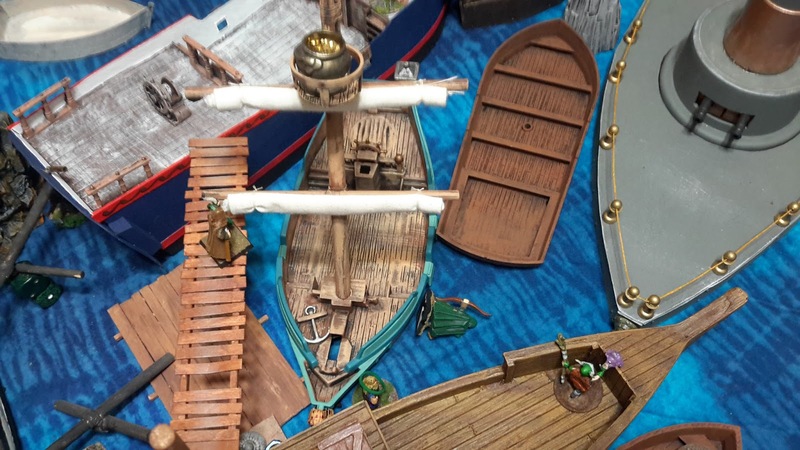 First, he had to find a new warden willing to join his crew (His previous warden, Anemone, didn’t survive the last outing) and a new pearl diver. He sent members of his crew out to inquire around the port town. In the end, there were not many wardens available for hire. Skorri settled for a young Beast Warden named Agger. While he looked like a kid, he seemed to be a skilled magic user, and well versed in all things dealing with wild animals. That might come in handy in the jungles Skorri planned on trekking through in search of the map stones to lead him to the magic fountain. 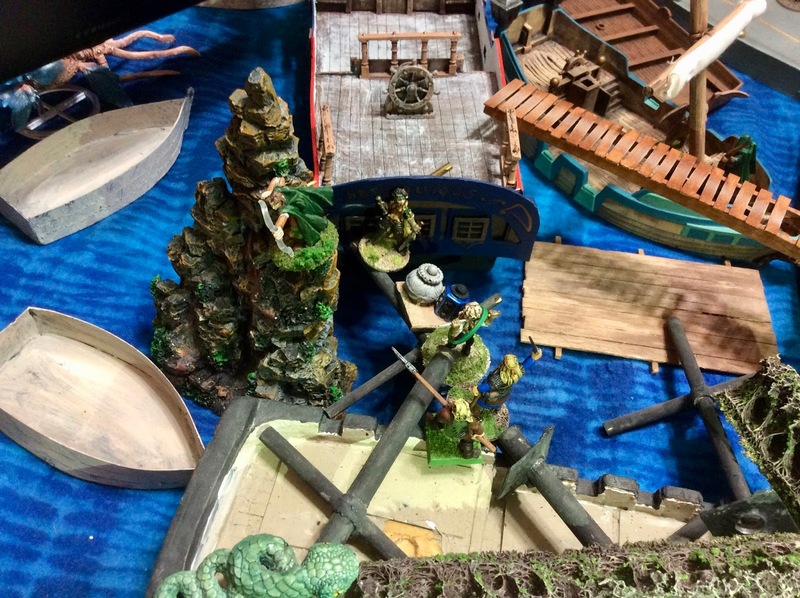 Several of his crew came back with tales about a floating mass of lost ships that was recently sighted. Skorri conferred with Kukala (Hunter) who was still recovering from a bad wound. It was decided that they would sail towards the sea of lost ships before heading back into the archipelago. Here, it is said, you will find a few rocks jutting out of the depths, eternally waiting for some unsuspecting ship to gut itself, spilling sailors and cargo into the ocean. 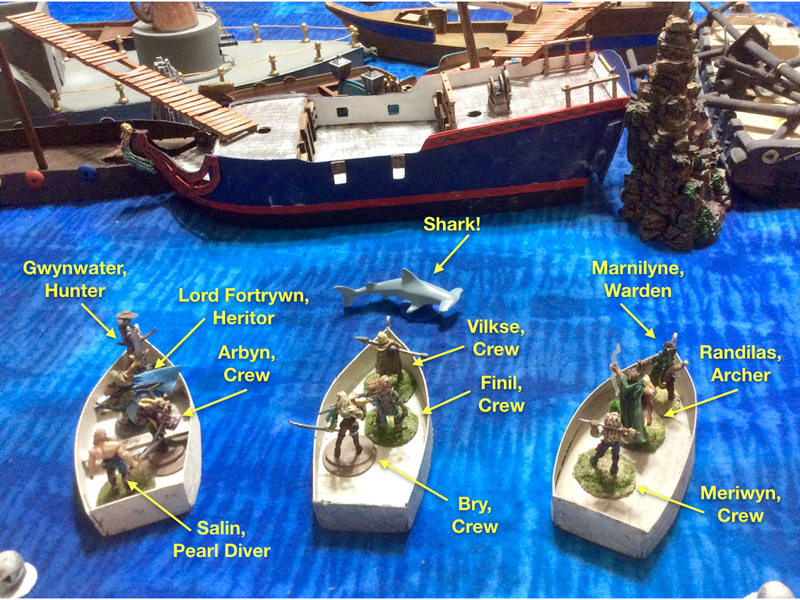 The area attracted a large number of sharks and other denizens of the deep, anxious to feed on the poor sailors whose ships met their doom on the rocks. But not all the ships drawn into this morass were sunk. Many were merely trapped here by the whirlpool like currents which causes ships and other debris to collect in a single area and became entangled. 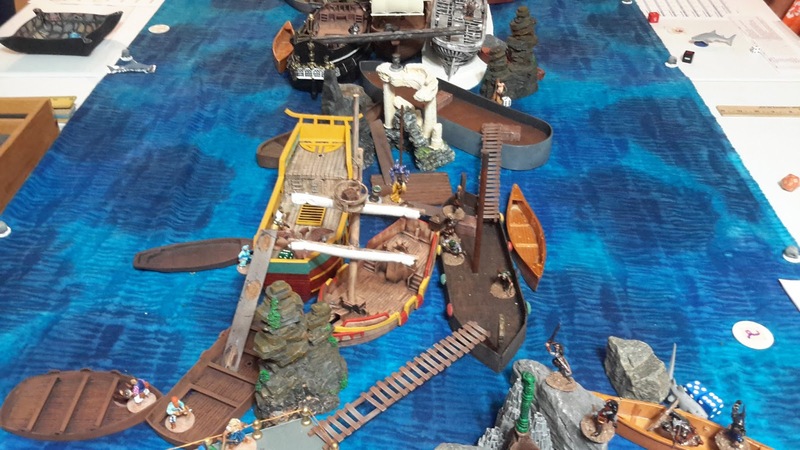 As they approached the area known as the Sea of Lost Ships, “Sails to the port and starboard” rang out from the crow’s nest. Skorri turned his looking glass left and right, scanning the distant, looking for Griffin’s ship. None of them seemed to be flying personal banners or flags. That means they are most likely other Heritors, they tend to be a secretive bunch. All of the ships looked like they had been here for quite some time. Skorri couldn’t detect any movement on the decks of the stranded, derelict hulks – manned only by the ghosts of their doomed crews. He did spot several flying creatures with long, deadly looking beaks flying around the top masts of several of the ships. “Those are called Taloned Jackclaws, or Talonjacks for short. They like to grab you and drop you in the water.” volunteered Agger. Afraid of becoming entrapped with the mass of rotting ships, Skorri directed his crew to heave to about a half mile away. Adding his ship to the floating mass was not part of his plan. Hopefully there would still be something of value waiting to be plundered. And with that thought in mind, Skorri loads his crew on three small boats and they set off towards the entangled mess of old ships. As they move forward, Taucher spots a shark swimming towards the boat. 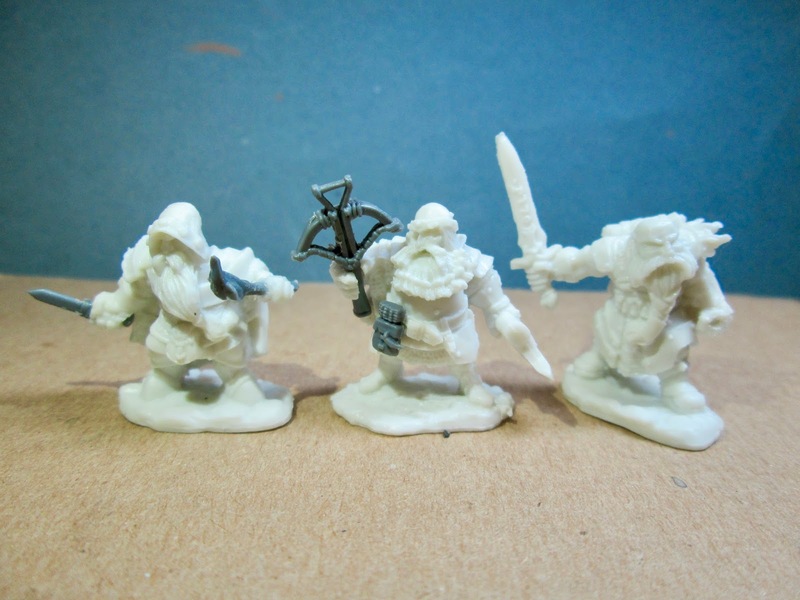 Skorri directs his archers, Amras and Amrod to shoot it. They both take careful aim and let fly their arrows. 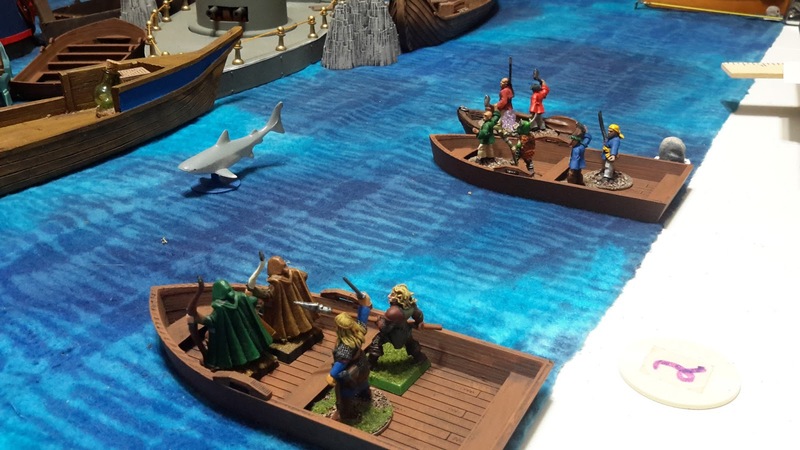 Amras strikes home but Amrod’s arrow glances off the shark’s tough skin. Skorri sees that the extra archery training has not paid off yet. He stands up and draws his bow. His arrow flies true and strikes the sea creature in the eye. The crew cheers as the shark turns belly up and slowly sinks beneath the waves. Directly across from Skorri’s crew, on the other side of the mass of ships, the sounds of a fight can be heard. Mostly screams and a lot of splashing noises. Sounds like Fortrywn’s crew has run into a bit of trouble. Skorri smiled at the thought. 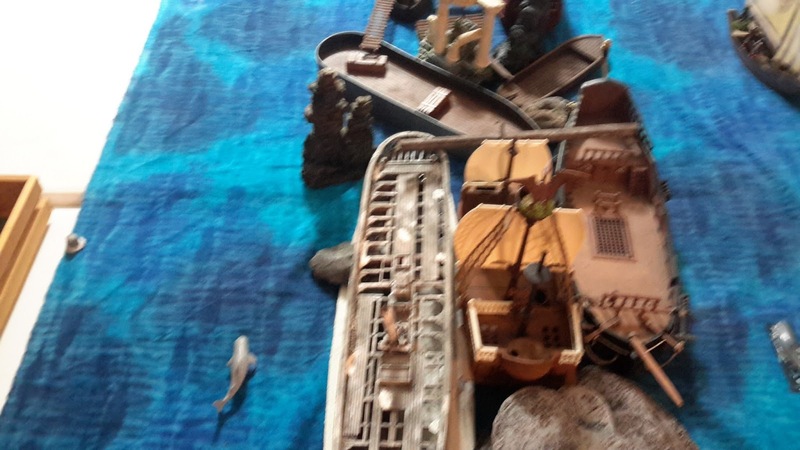 With the shark dead and sky starting to become overcast (Molly Malone’s warden cast Cloud Cover), Skorri directs his newly recruited Pearl Diver to follow him towards the black hulled wreck off to the left. He checks to make sure his Piscian Helmet is secure before he dives in; Taucher jumps in right behind him. 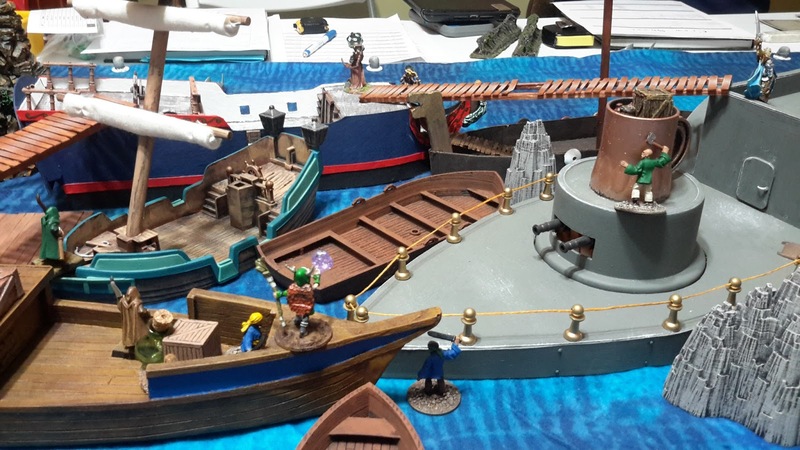 Amras climbs up on the abandoned ship, carefully timing his jump with the up and down rocking motions of the two ships (Need a Move roll with a target of 14 to successfully move between ships). Once on the other ship he slowly surveys his surroundings. There are several ships entangled together. 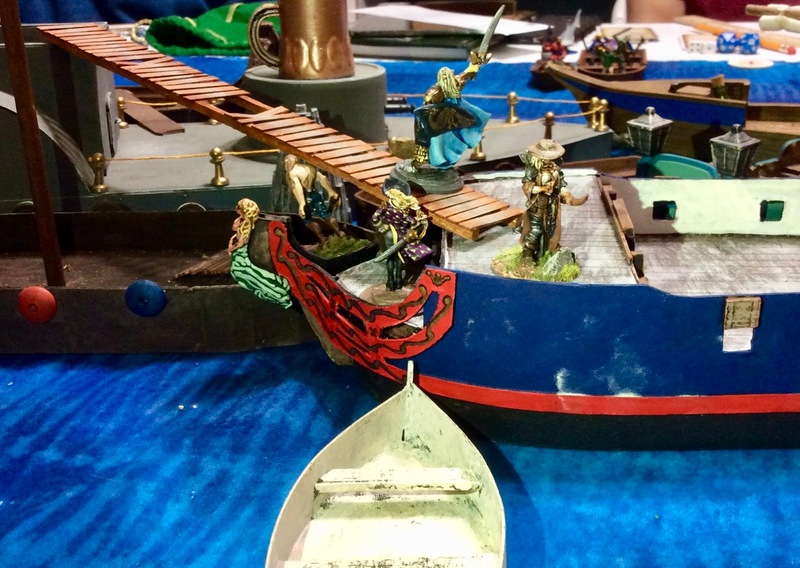 On a nearby ship he notices another crew climbing aboard, he recognizes Fortrywn’s archer. He takes aim at her and let’s fly. The shaft flies straight as an arrow. With a loud “thwack” it strikes the opposing archer in the back, dropping her to her knees (Hits Fortrywn’s archer for 10 points of damage). While silently congratulating himself, strands of seaweed shoot up from the rotting decking and weave themselves around his bow. Amras quickly cut them away but the damage had been done. His finely crafted bow had a slight warp to it (Fortrywn’s Warden cast Warp Weapon, -1 damage). Amrod successfully jumps to a another nearby ship. As he lands, Agger casts Envenom on his bow. Blue Boy runs over to a pile of trade goods and roots around. He finds a small chest that he places in his backpack. Yen Lo attempts to jump between two ships. His foot lands on a pile of moldy kelp causing him to lose his balance. He unceremoniously lands in the water. 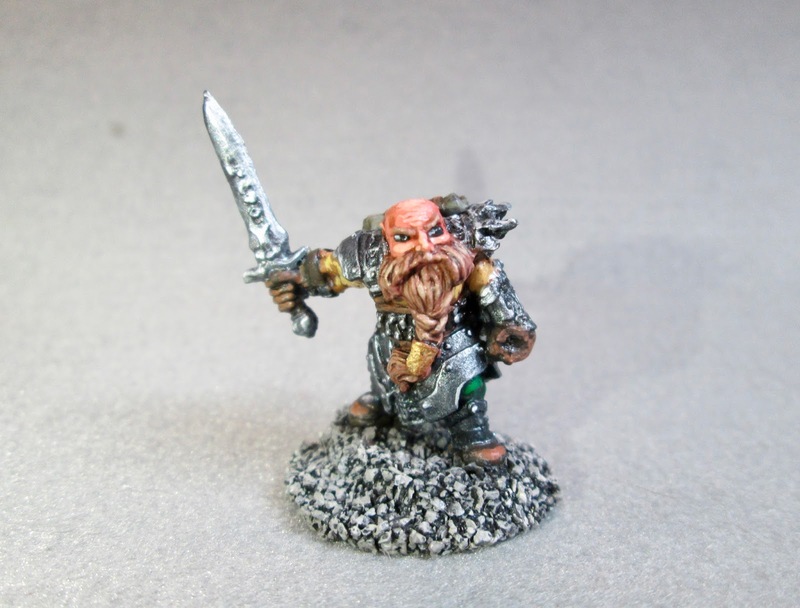 Hat Chet fares better and makes the move to an old Dwarf ironclad with ease. As he lands, he finds himself staring down the barrels of two old, rusty cannon sticking menacingly out of a turret. He decides to start climbing up to the crow’s nest on top of the turret to get a better look at the other hulks. 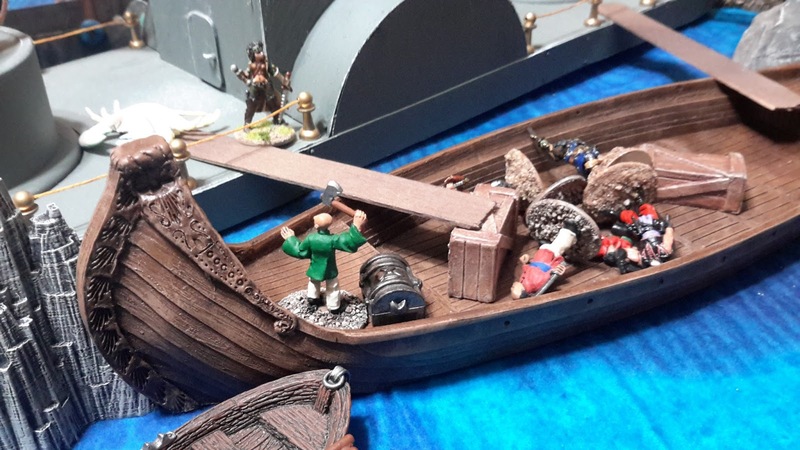 Meanwhile, Wu and Wat Lee have been rowing towards an old longship. They make it there and climb aboard only to find they are not the first to board. 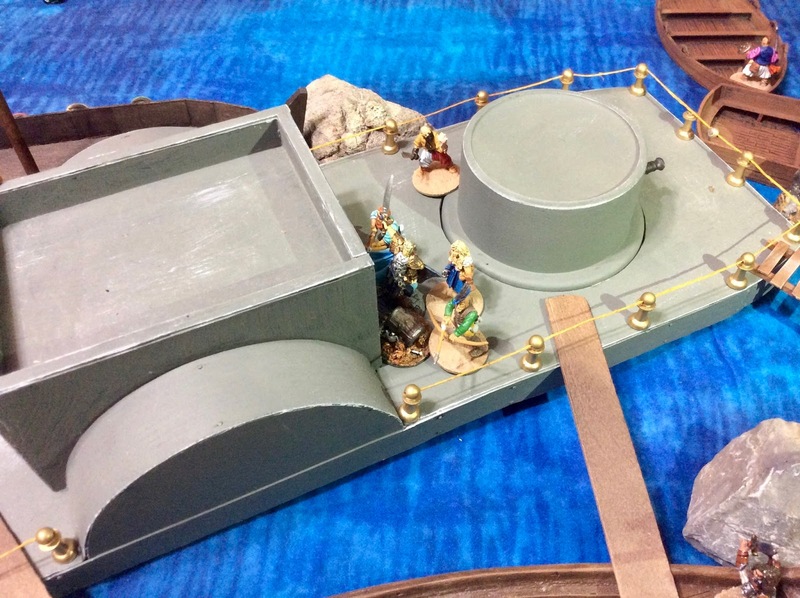 One of Kragmar’s crew members is already there – and it seems he has discovered a treasure chest. Two against one, this should be easy pickings. 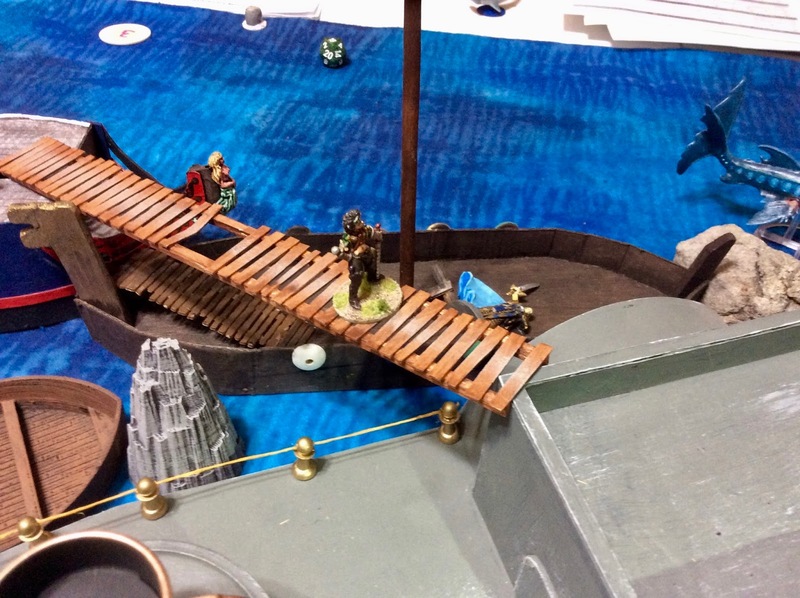 As the clouds continue to drop lower, further reducing visibility (14" LOS), Skorri and Taucher swim around to the black ship. They can see several members of Fortrywn’s crew aboard. They both attempt to climb up the hull but Taucher cannot find a footing in the slimy algae covering the hull. 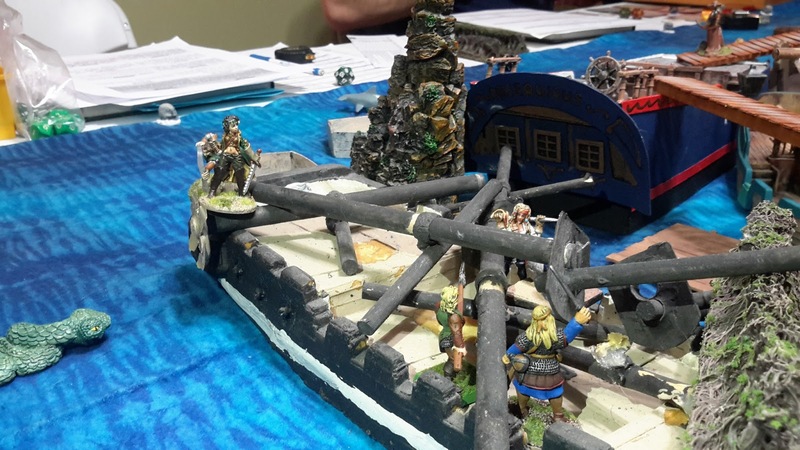 Skorri almost makes it to the top before a piece of rotting timber sends him splashing back into the water. Fortrywn’s warden looks down and sees Skorri in the water. Skorri hears her chuckle as she intricately waves her hands as only a spell caster can do. Skorri feels tendrils of kelp twirling around his sword. His strength is sufficient to break free of the plant but he notices the balance of the weapon had been affected (Fortrywn’s warden cast Warp Weapon on his sword, -1 Fight). Agger has now successfully climbed aboard the dhow. He decides to provide the crew some assistance by attempting to cast Summon Animal. He successfully called forth to the nearby creatures and could soon sense a large snake approaching. He should be useful to distract Fortrywn’s crew. Out of some hidden hole, Amras sees a mangy looking rat jump on Amrod’s back. He moves forward, “Hold still, I’ve got it” yells Amras as he pulls his dagger and takes a swipe at the rat (The real rat, not Amrod). Luckily for Amrod his aim is good and the rat flies off into the water. Amrod says “Thanks” as he takes aim at one of Fortrywn’s crew. The gentle rocking motion of the ship was just enough the throw off his aim. 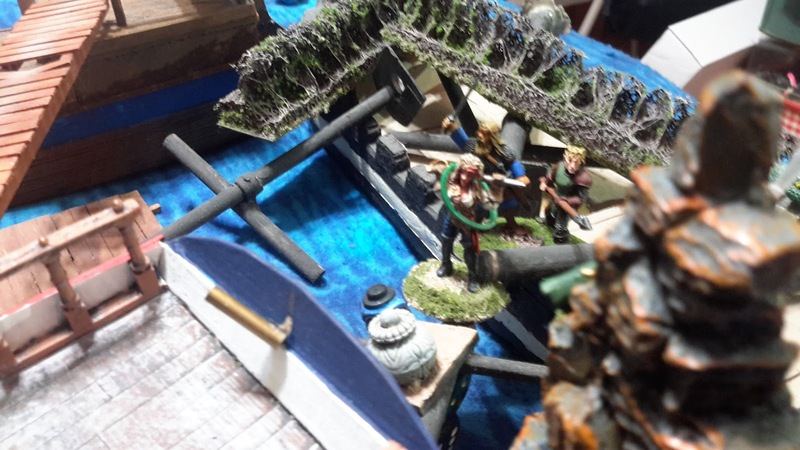 Over on board the longship, Wat Lee and Wu engage Kragmar’s crewman. Between the two of them, they manage to beat him back from the treasure chest. During their scuffle, the clouds have descended far enough down that they are like a fog surrounding the mass of ships (visibility is 12" LOS). At the top of the mast of the ship Amrod has boarded, Agger spots another Talonjack. He casts Control Animal but once again he feels the creature resist his charms. On the longship, the fight intensifies. Wu and Wat Lee team up to take down Kragmar’s crewman. Unfortunately, Wu’s attack is parried and Kragmar’s crewman takes him out with a clever riposte. While Kargmar’s crewman is slightly off balance, Wat Lee’s thrust takes him in the side and drops him to the deck. As the opposing crewman falls, Wat Lee sees a large crab rear up out of the water, two massive claws snapping in his direction. He manages to avert the crab’s attack and drives it back (caused 1 point of damage). 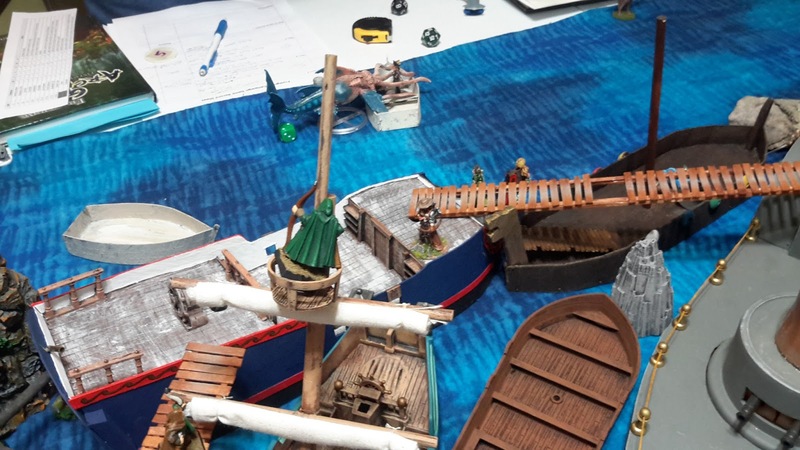 Just as he thinks all is well, a giant shark leaps up and swallows him whole before disappearing back into the murky water (End of game Recovery roll for Wat Lee was a 2). Back at the black hulk, Skorri looks at Taucher, “We have to climb over, don’t let him get away” (talking about Fortrywn’s crewman carrying the treasure). He watches as Taucher carefully makes his away across the tangled mess of kelp vines and seaweed. Taucher then charges into contact with Fortrywn’s crew. 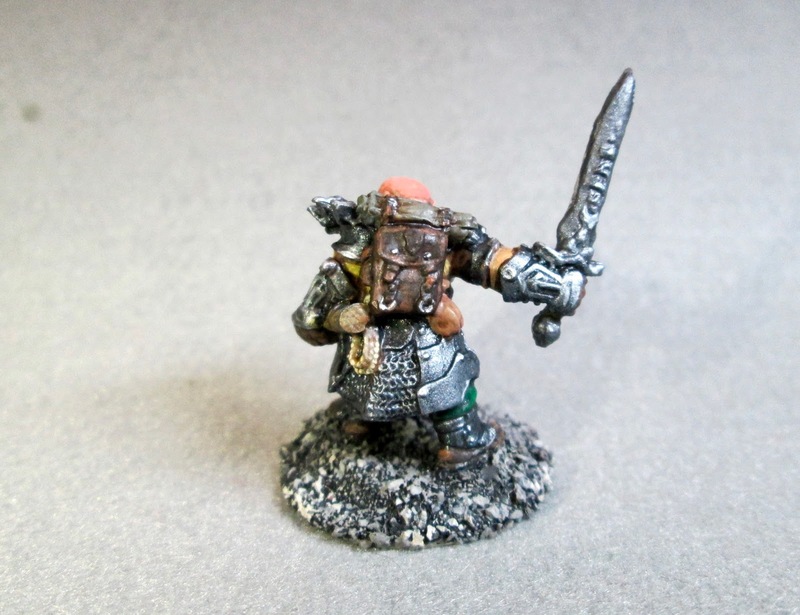 The crewman turns around to confront Taucher and sees Skorri easing his way through the brambles. 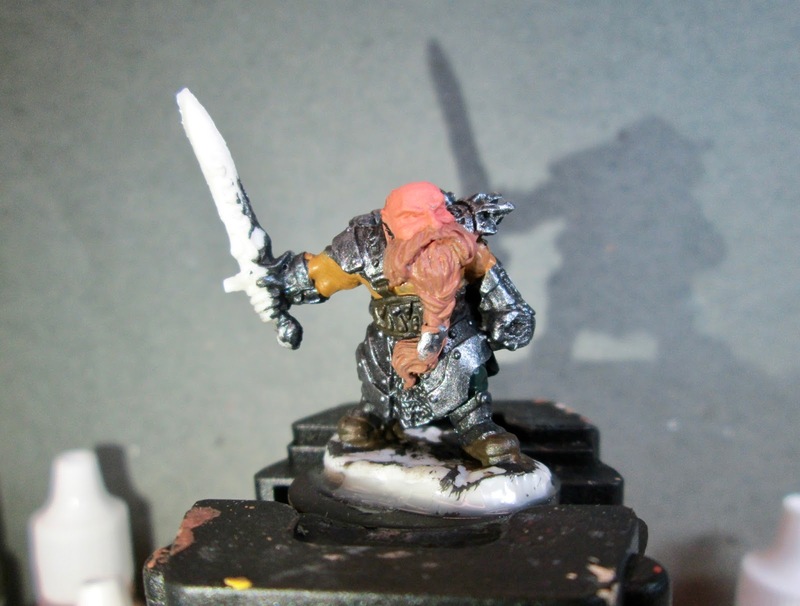 Skorri also charges towards the crewman, drawing his sword along the way. He then feels his blood boil as he Surges to attack the crewman. The crewman frantically tries to defend himself from the onslaught but he knows he is no match for the Heritor’s skills. 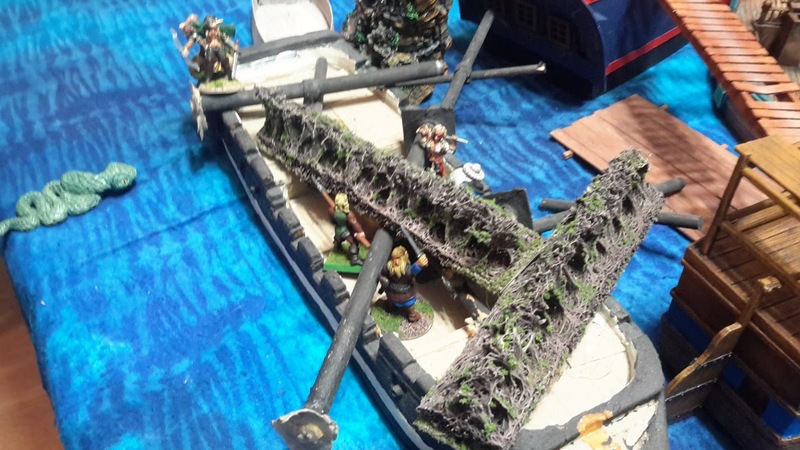 Nicked and bleeding from several small gashes, the crewman tumbles into the water below. Taucher manages to grab hold of the small chest before it too falls into the water. Just as he grabs it, an arrow nicks his arm (1 point of damage). On the dhow, Agger reaches out mentally to control the Talonjack. This time his mind is stronger and he feels the animal bending to his will (Successful casting of Control Animal). 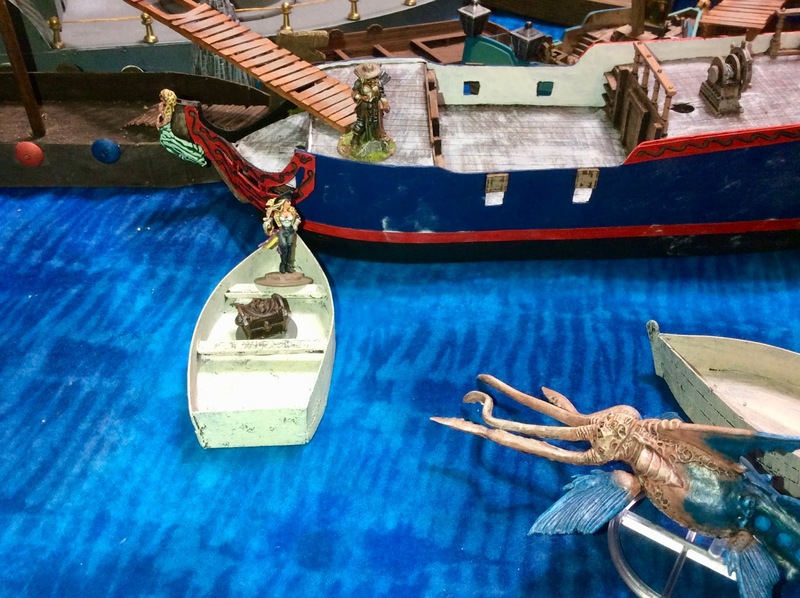 Agger directs the creature to fly over to the dwarf ironclad and attack any non-friendly crewman he finds. 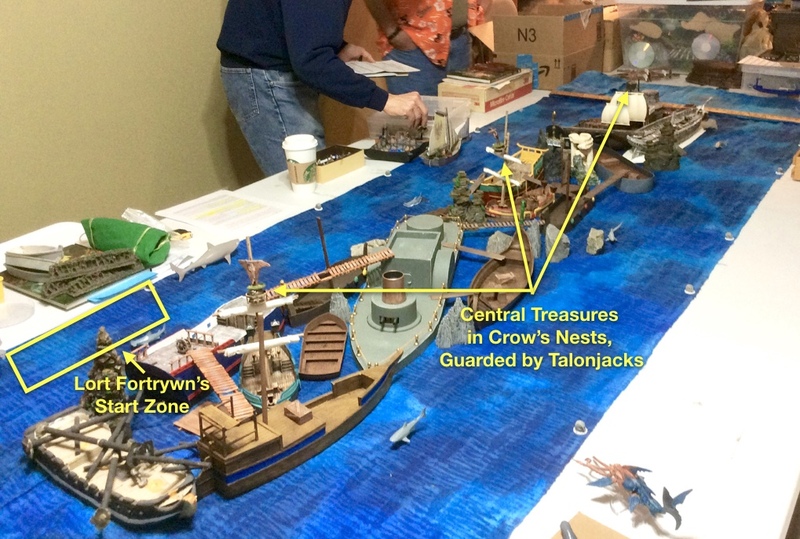 The Talonjack flies over to the ironclad and attack’s one of Molly’s crewmen carrying a chest. Agger feels the bond with the Talonjack break as the crewman manages to easily overcome the creature. 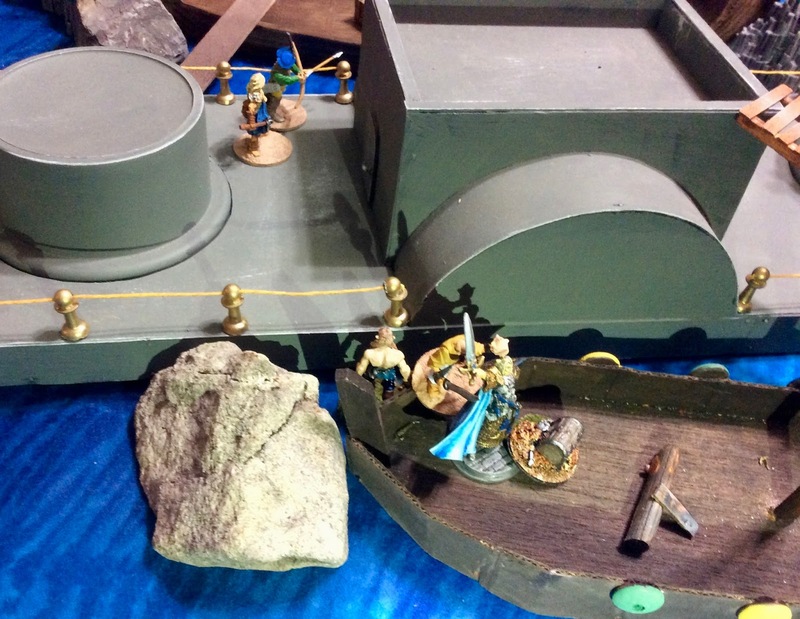 On the ironclad, Hat Chet found a treasure inside the crow’s nest. He pulls it out and drops it to the deck of the ship. Yen Lo waves as he runs over and picks it up. He then jumps back into the crew’s small boat. Taucher says, “Its faster to swim over to the dhow ” and jumps into the water. 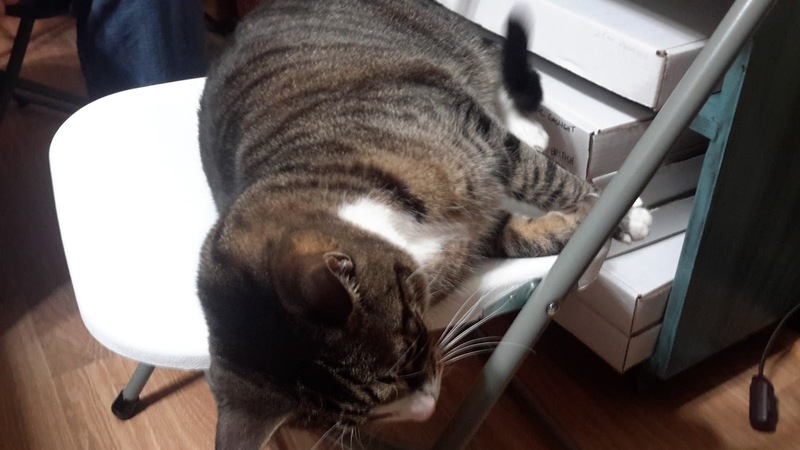 Skorri agrees and jumps in also. 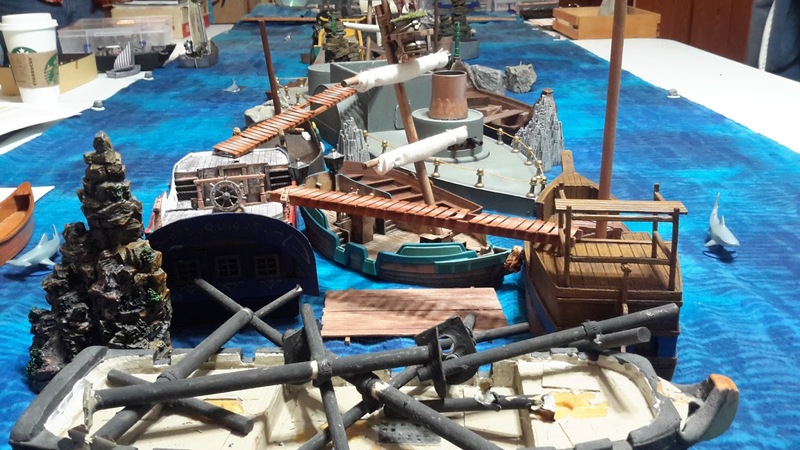 He lands beside Fortrywn’s crewman who is floating in the flotsam. Skorri quickly checks on his condition to make sure she doesn’t drown herself. Seeing that she will recover, as long as she not eaten by a shark, he climbs aboard a small seaweed covered raft. Spying one of Fortrywn’s archers on a rocky outcrop, he once again Surges to shoot an arrow in his direction. Even though it was a snap shot, the arrow strikes its target in the chest. Without waiting to see the outcome, Skorri turns and follows Taucher. During this time, the large snake slowly slithers towards the archer. The archer looks from Skorri to the snake, trying to decide which to shoot. He decides on the snake and puts an arrow into its thick body. Ignoring the pinprick, the snake continues its way up the rocky outcrop in pursuit. With the agility of a monkey, Amras quickly climbs to the top of the mast. After hauling himself onto the upper spar, he notices a treasure sack stuffed inside the crow’s nest. Amras called down to Amrod and Skorri, “I found something." As he leans over to pick it up, he fails to see the arrow speeding his way. The shaft embeds itself in his back pack. The force of the strike spins him around, arm flailing in an attempt to regain his balance. In the end, Amras tumbles into the water below. The impacts knocks the breath out of him and he floats there trying to recover his senses. 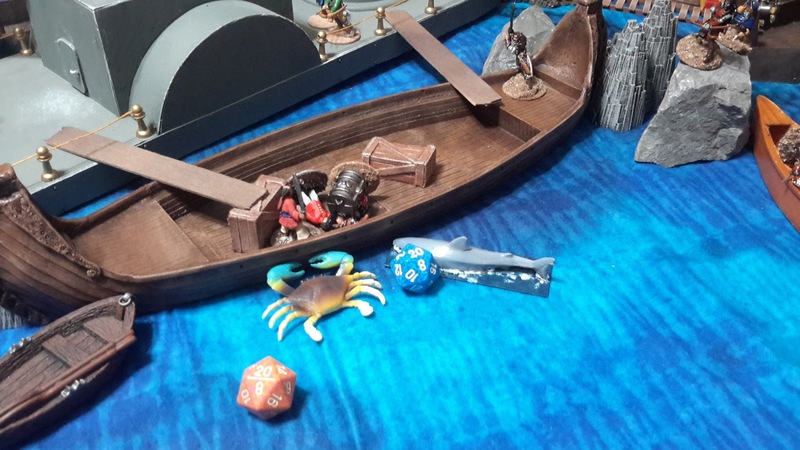 Over on the longboat, Hat Chet watches as another of Kragmar’s crew is taken down by the giant crab. "YES” he cries out but then realizes his mistake. The crab’s antenna-like eyes swivel in his direction. Before he can react, the crab scuttles across the deck, its claws menacingly clicking together. Hat Chet dodges the crab’s initial attack and leaps upon its back. Deftly performing a balancing act, he swings his axe down hard, striking the crab between its eyes. As crab’s legs collapse, he thinks “Too bad I can’t get him back to the kitchen." Hat Chet, seeing the treasure chest laying on the deck, triumphantly runs towards it. He has to negotiate a mound of unmoving bodies but he manages to reach the chest. Seeing Amras fall, Skorri’s keen eyes scan the nearby ship for the perpetrator. Through the light fog, he could just make out the silhouette of Fortrywn’s archer standing at the rail and reaching for another arrow. 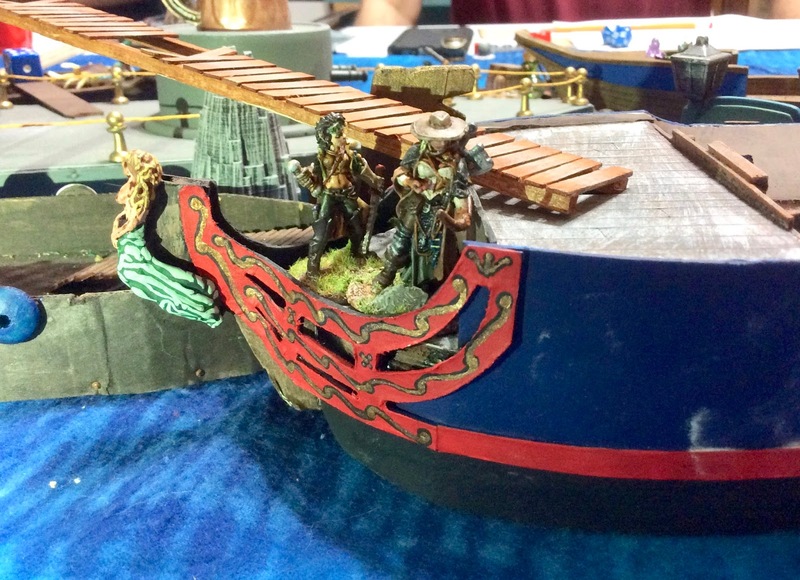 Skorri climbs aboard the ship and pulls out his bow. Grabbing an arrow from his quiver, he pulls back and lets it fly. He watches in dismay as the arrow skims off some rigging and misses its target. Uncontrollably, Skorri feels his blood boil and Surges to fire another shot. This time the arrow flew straight and true as Skorri watched the offending archer fall out of sight. Hat Chet picks up the chest, pausing a moment at the carnage all around him, and then moves to his rowboat. As he is getting ready to climb down, he hears the pitter-patter of small feet on the deck. He quickly turns just as Fortrywn’s warden swings her sword. He ducks under her swing, deflecting it with his axe as he spins to face the diminutive young girl. "Go home little girl” he says as he makes an overhead swing at her. To his surprise, she manages to deflect his aim. Instead of smacking her on the side of the head with the flat side of his axe, the momentum forces the axe to slice downward along her leg before embedding itself in the toe of her boot. 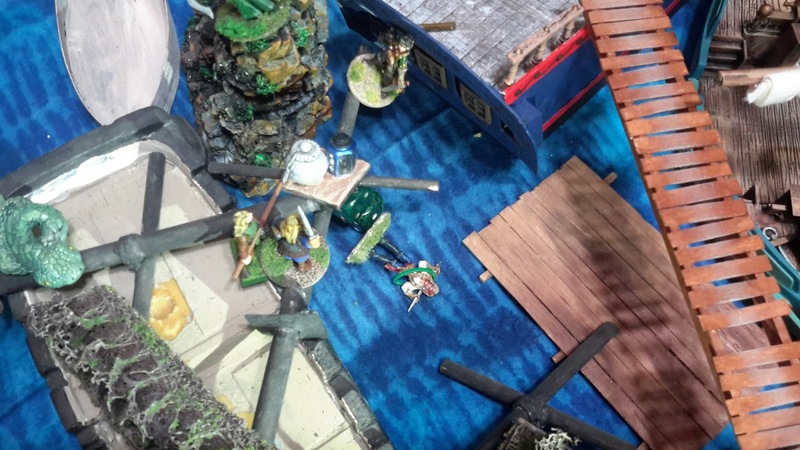 The young warden loses her balance and her head strikes the deck with a hollow thud. She’s out cold. With little effort, Hat Chet pulls his axe out of the decaying decking. “That’ll leave a scar” he thinks. 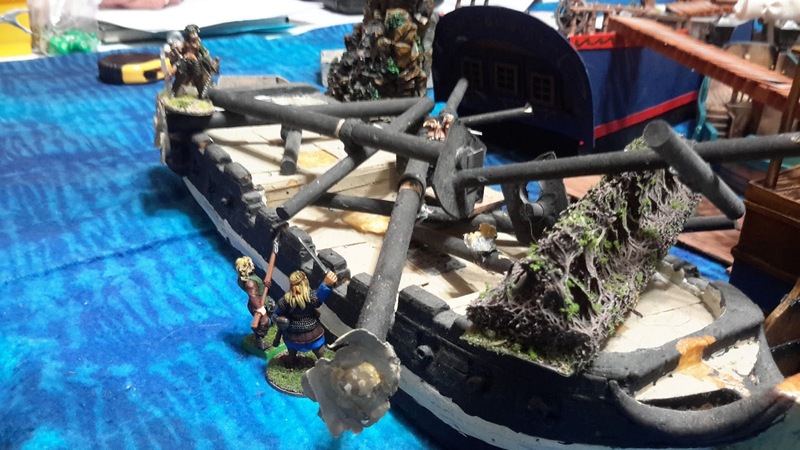 Hat Chet turns to carefully climb down into the rowboat with the hard fought over treasure (five crew and one warden were taken down trying to recover this treasure – Kragmar lost three, Skorri lost two, and Fortrywn lost his warden). 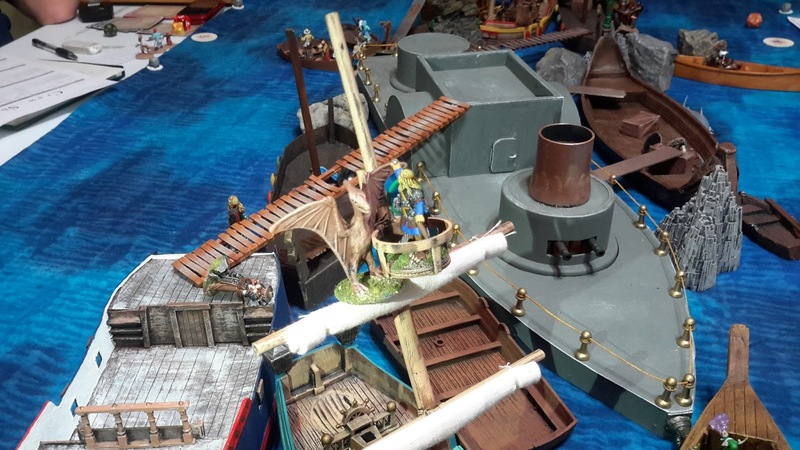 Skorri climbs up the mast towards the crow’s nest. As he nears the top, he hears the flapping of wings and looks up to see another Talonjack settle on top of the crow’s nest, and his treasure. With a burst of energy, Skorri climbs the final few feet to the top and draws his sword. With some fancy sword play, he manages to feint to the left before twisting his sword into an upward swing that severs the Talonjack’s head. Feeling a bit of pain as his blood heats up, Skorri Surges forth to pick up the treasure. 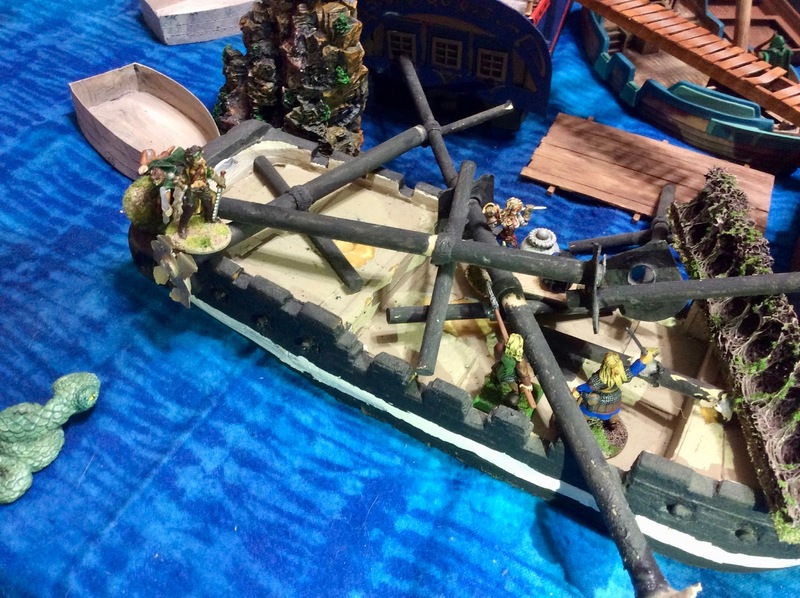 He drops the treasure to the deck below and quickly climbs down. He then signals to his crew to climb into their boats and return to the ship. Back aboard the Raven’s Beak, Skorri saw to the welfare of his injured crewmen. Wat Lee was the only crewman who did not make it back. He authorized a double ration of rum and they drank a toast in honor of Wat Lee – “May he give the shark indigestion." He then headed into his cabin to look over the day’s haul. 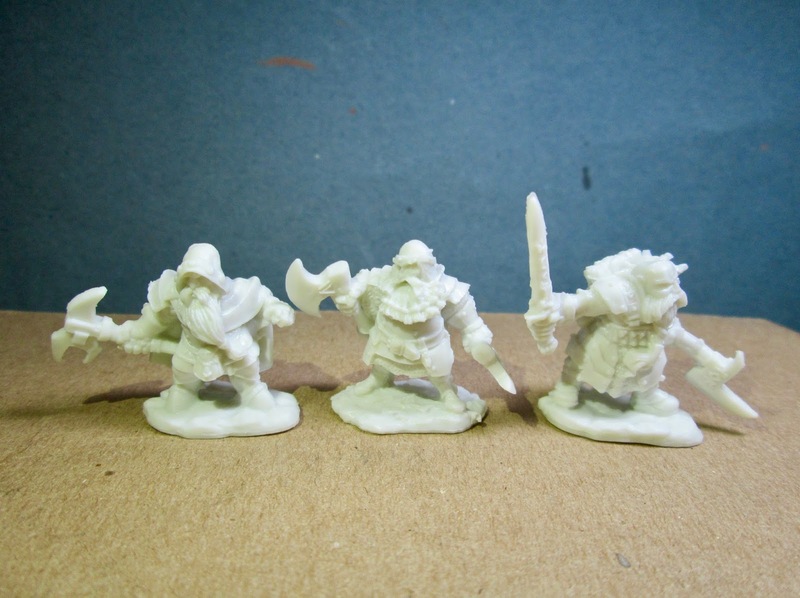 Incredibly, five treasures were recovered: Ring of Will, Jade Figurine (Crocodile) w/30 gold, Superior 2-hand weapon +1 damage, Magic hand weapon +1 Fight w/10 gold, and a Water of Life Potion and some Scalegrass herb. The magic hand weapon would be a welcome replacement for the sword he lost last time. Well, another enjoyable and action packed game that kept me on my toes for all 9 turns. Modifying the solo scenario into a multi-player version turned out better than we thought. 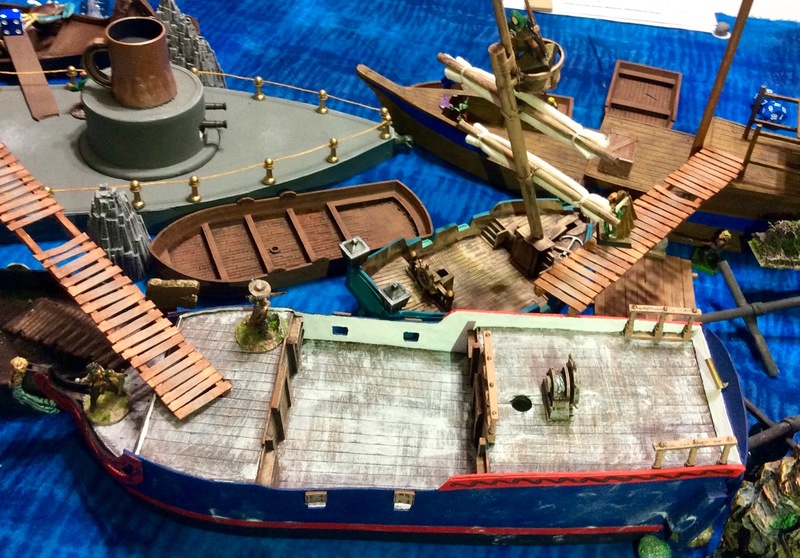 Plus it helped that the group happened to have a good number of ships to use as the floating graveyard. 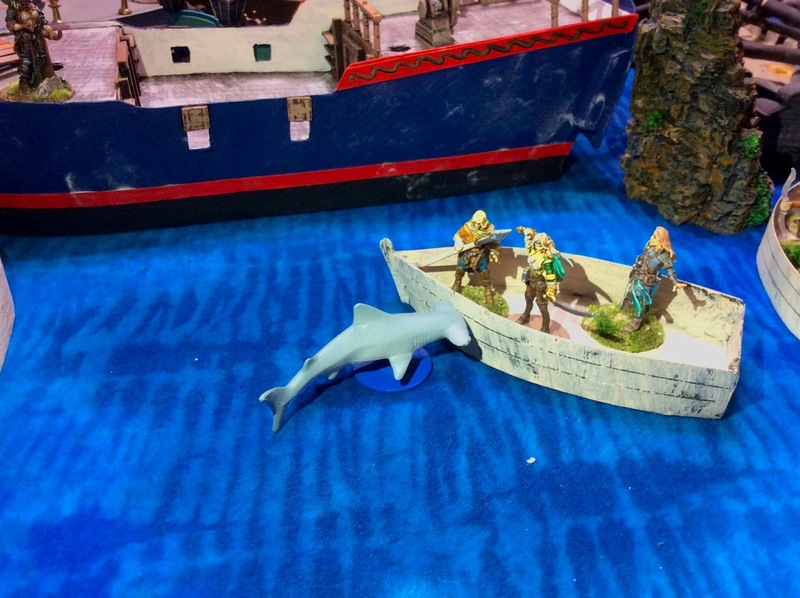 Skorri and crew took advantage of Fortrywn’s first turn misfortune of losing three crewmen to a single shark. With that and Molly Malone occupying his attention on his flank, they secured five treasures. And only loss three personnel in the process. 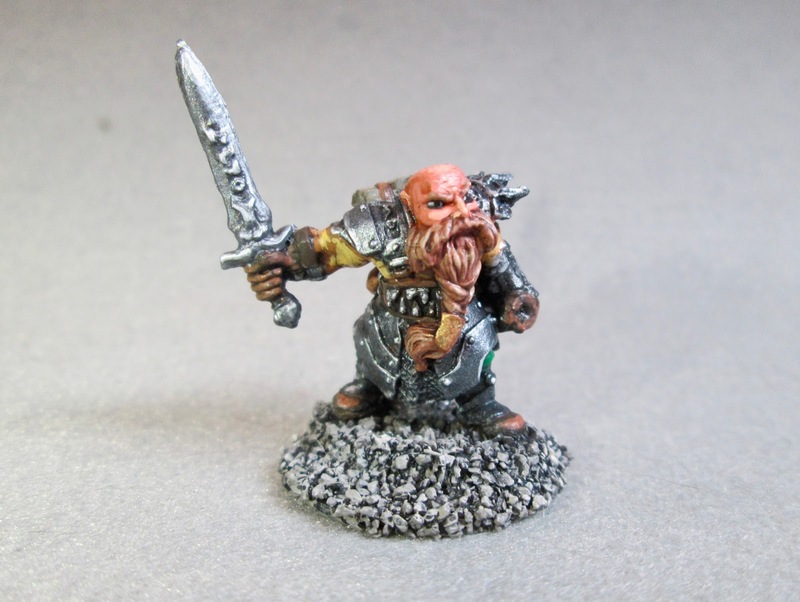 When I recruited a new warden, I decided to change from a Wave warden to a Beast warden to try some different (Plus I had one of the new Wiz Kids pre-paints I wanted to use). I’m hoping his spells will be a benefit to the crew. Already looking forward to the next game……. 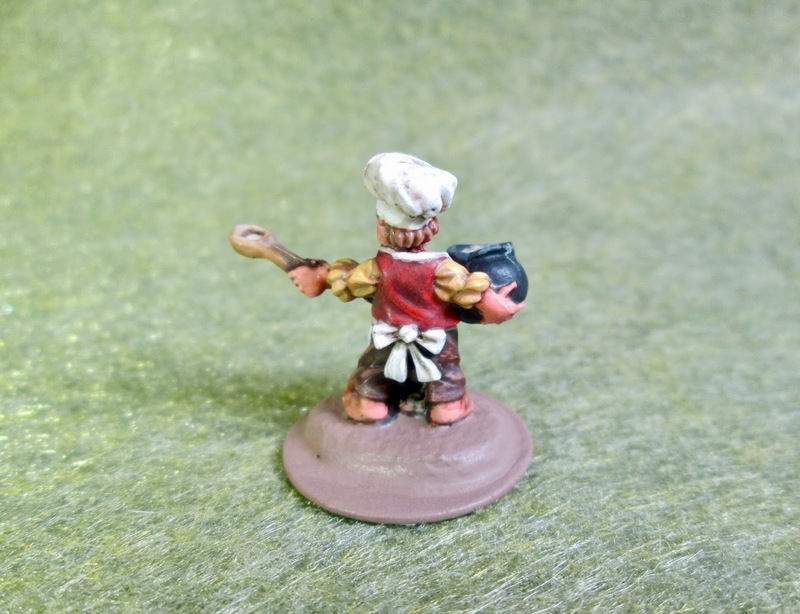 This past week I returned to working on the Townsfolk set from Bones 3, and painted the Elven Blacksmith. I prepped the figure in the usual way; soaking it in a dish of water with a couple drops of dish-soap added, then giving it a light scrub with a soft toothbrush, and then rinsing and drying it. 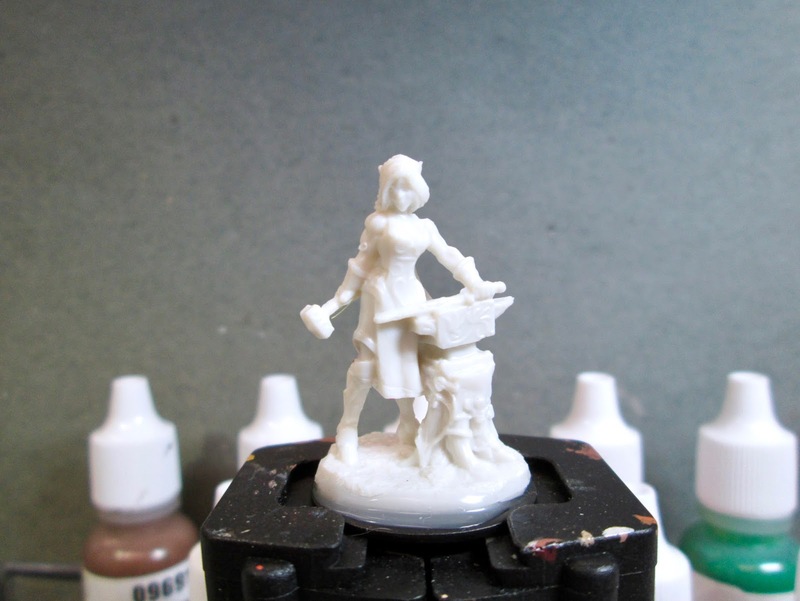 I then glued the figure to a black-primed 1" fender washer with Aleene’s Tacky glue. 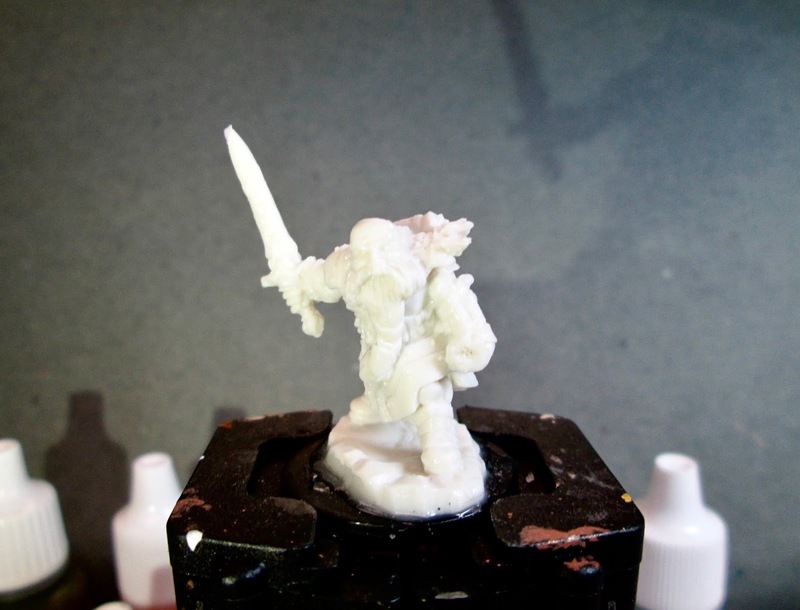 And, when the glue was dry, I put it in my Citadel painting grip. 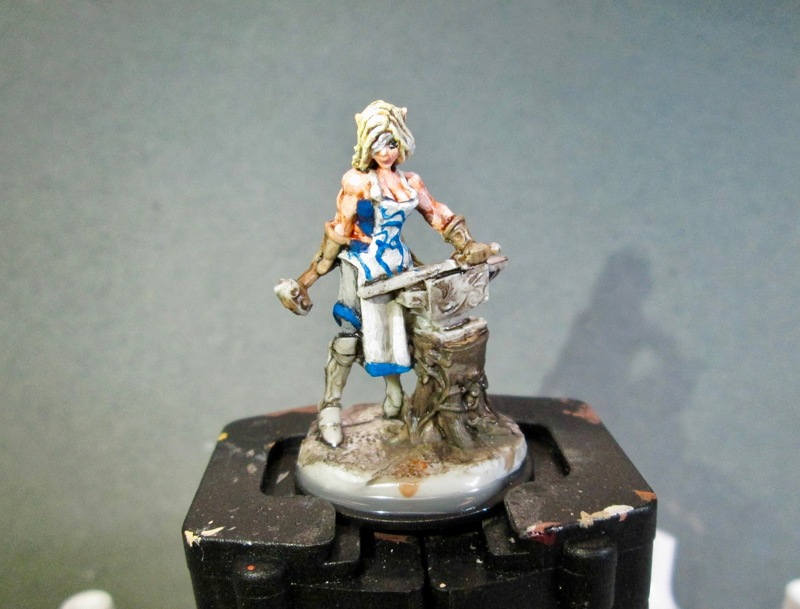 I began by painting her skin with Apple Barrel “Flesh”, When it was dry, I gave it a wash with some Citadel “Reikland Fleshshade” wash. 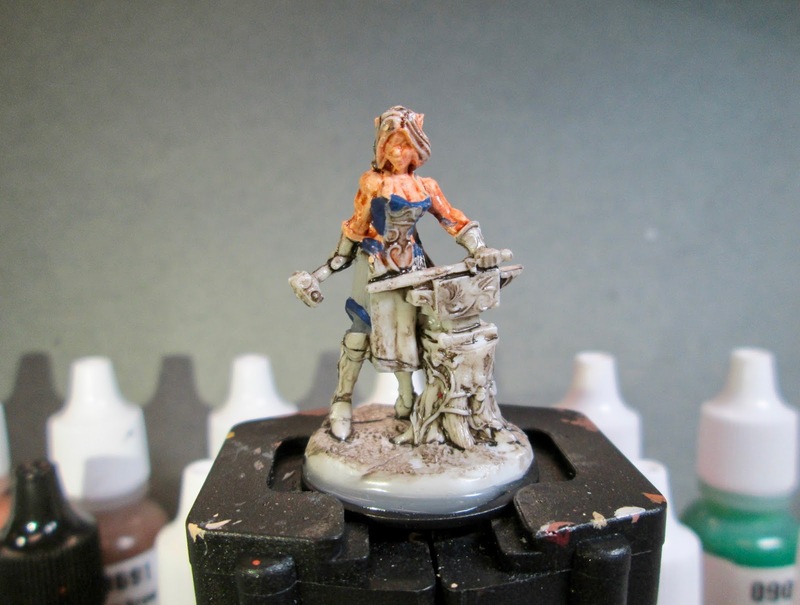 When that was dry, I painted her leggings with Americana “Zinc”, and her skirt with Crafter’s Acrylic “Storm Cloud Grey”. I then painted her top, and the borders on the skirt, with Crafter’s Acrylic “Navy Blue”. 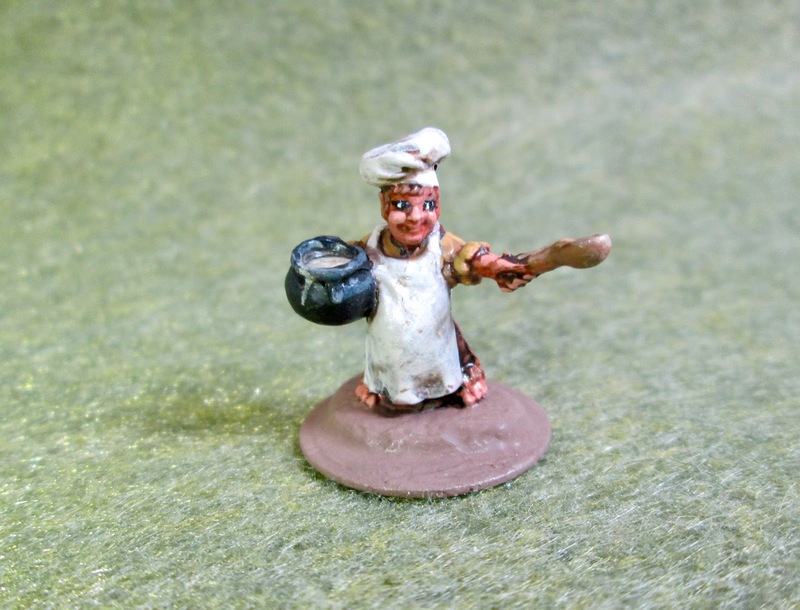 Next, I painted her apron, and her eye wrap, with Folk Art “Platinum Grey”, and her gloves with Crafter’s Edition “Taupe”. 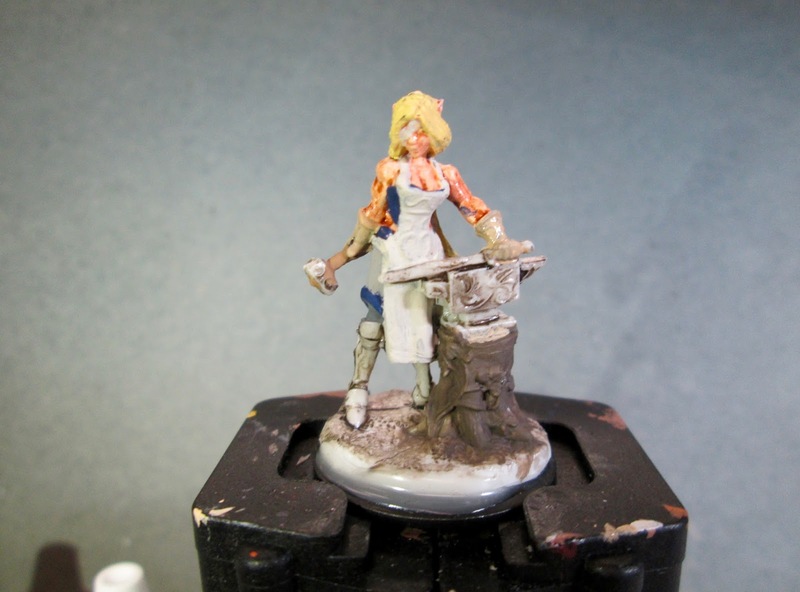 I then painted the handle of her hammer with Ceramcoat “Territorial Beige”, and her hair with Accent “Golden Harvest”. After that, I painted the bark of the tree trunk with Americana “Charcoal Grey”, and the interior of the trunk with Reaper MSP “Ginger Cookie”. 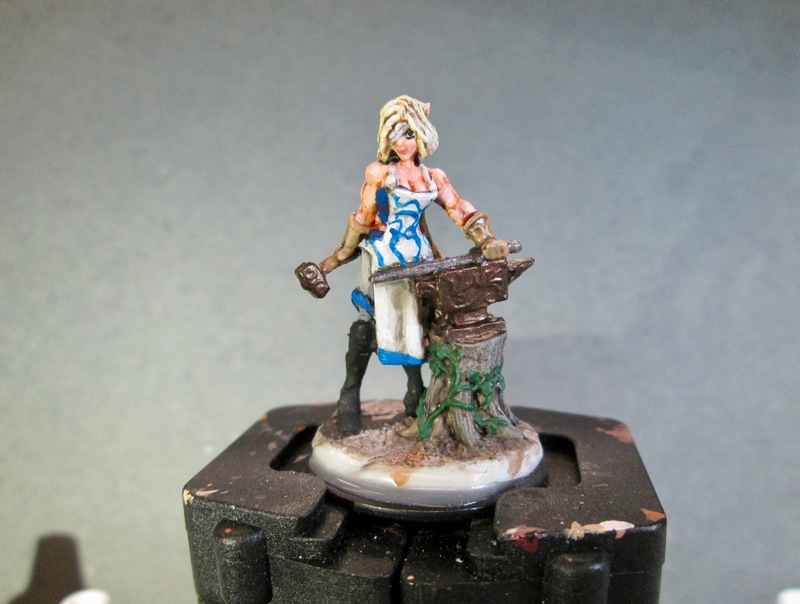 I let everything dry for a while, and then gave the tree trunk, her hair, the gloves, and the hammer handle, a wash with Citadel “Agrax Earthsahde” wash. 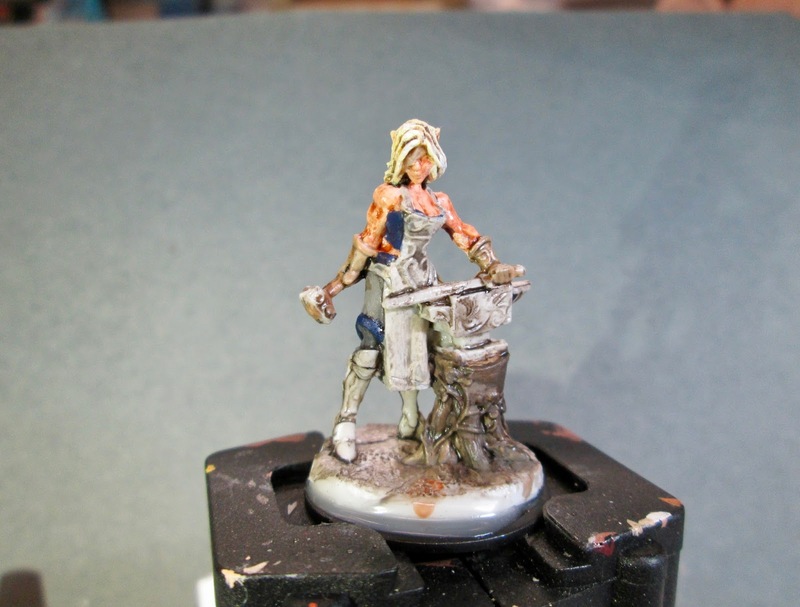 When the wash was dry, I then gave her leggings, skirt, apron, and top all a wash with Citadel “Nuln Oil” wash. When that was dry, I worked on highlighting her hair, drybrushing it first with Americana “Moon Yellow”, and then Apple Barrel “Lemon Chiffon”. I then touched it with a few Americana “White” highlights. Next, I painted in her eye and mouth, and then highlighted her skin with the base “Flesh” and the “Flesh” mixed with a little Americana “White”. I then highlighted her leggings with the “Storm Cloud Grey”, and highlighted her skirt with a mix of the base “Storm Cloud Grey and some of the "Platinum Grey”. 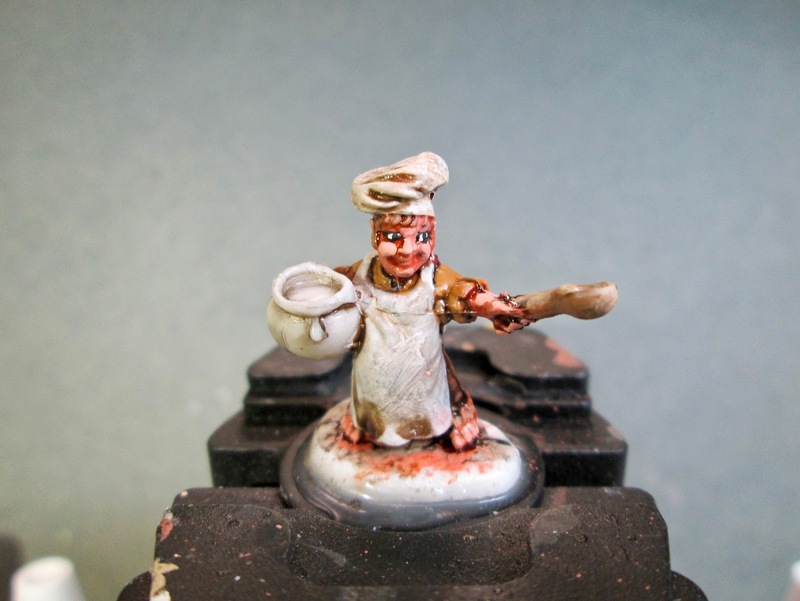 After that, I highlighted her apron, and her eye wrap, with a mix of the “Platinum Grey” and the “White”. I then highlighted the border on her skirt with Americana “True Blue”, and afterwards, used the “True Blue” to paint the decorations on her apron. When I was finished, I went back and highlighted those decorations with some of the “True Blue” mixed with a little Crafter’s Edition “Tropical Blue”. Next, I painted her boots with Americana “Black”. 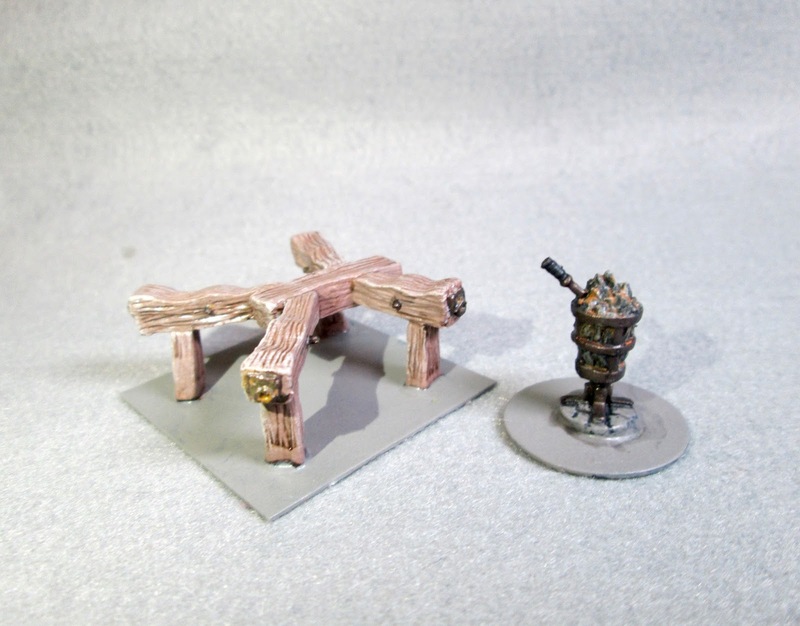 I then drybrushed the tree trunk with, first, “Americana "Neutral Grey”, and then with Folk Art Barn Wood". After that, I painted the anvil and the head of the hammer with Reaper MSP “Scorched Metal”, and I painted the sword with Accent “Princely Pewter. I followed that with painting the vine on the trunk with Reaper MSP "Christmas Wreath”. 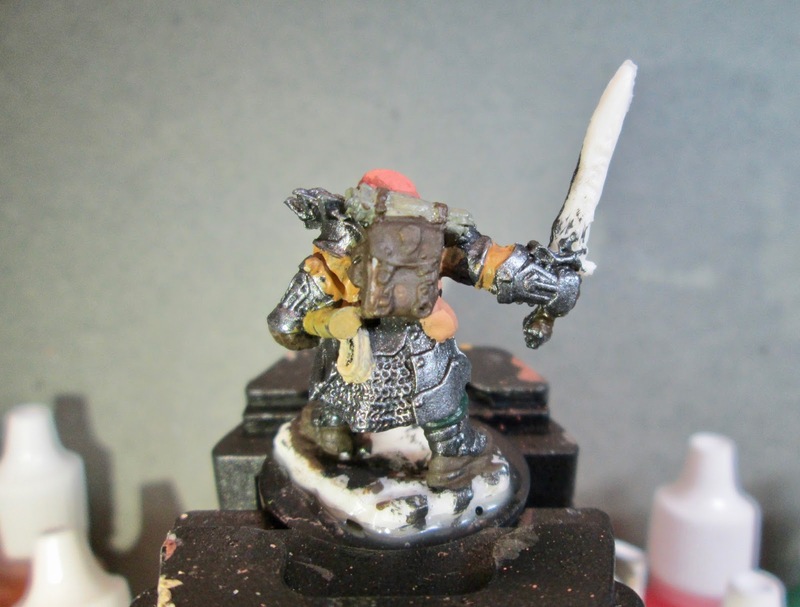 After the new colors had time to dry,I gave the hammer head, anvil, and sword all a wash with the “Nuln Oil”. I then drybrushed the anvil and hammer head with Folk Art Brushed Metal “Brushed Bronze”, and then painted the scrolling on them with Ceramcoat “Wedding Gold”. After that, I worked on making the sword look like it was still a little molten by layering on Reaper MSP Bones “Cinnamon Red”, Reaper MSP “Holly Berry”, Reaper MSP “Hearth Fire”, and Reaper MSP Golden Glow" I had to keep doing it several times and in different thinnesses until I got a look I was happy with. When I was happy with the sword, I moved on to the vine. I thought I’d try something a little different, so I first tried doing the highlights with Folk Art Color Shift “Green Flash”, but I felt it was too drastic of a color difference from the base “Christmas Wreath”. So I went back and tempered it with Crafter’s Acrylic “Wild Green”. 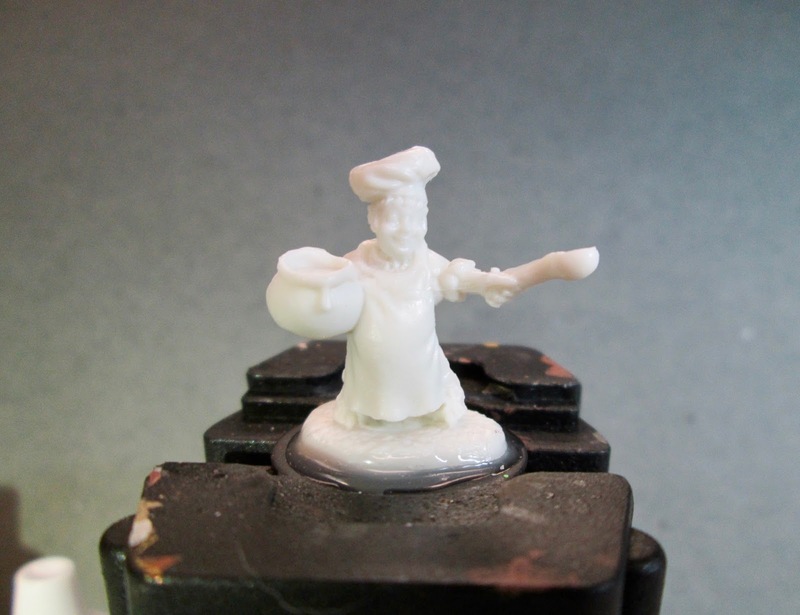 When I was done painting the figure, I used some white glue to glue some fine brown sand to the base. When the sand was dry, I painted it with a coat of Americana “Raw Umber”. When this was dry, I drybrushed the sand with the “Territorial Beige”, and then with some Folk Art “Butter Pecan”; lastly I drybrushed it with a little Crafter’s Acrylic “Light Antique White”. I let the figure dry overnight and the next day I gave it a coat of Americana “DuraClear Matte” varnish. When dry, I glued on some bits of grass tufts. Another overnight dry, and I sprayed it with Testor’s Dullcote". I’m really happy how she turned out! Particularly the sword and the anvil. I messed up her face a little on her left cheek; but given her missing eye, I figure she is a retired warrior, so a scar on her cheek looks fine to me. 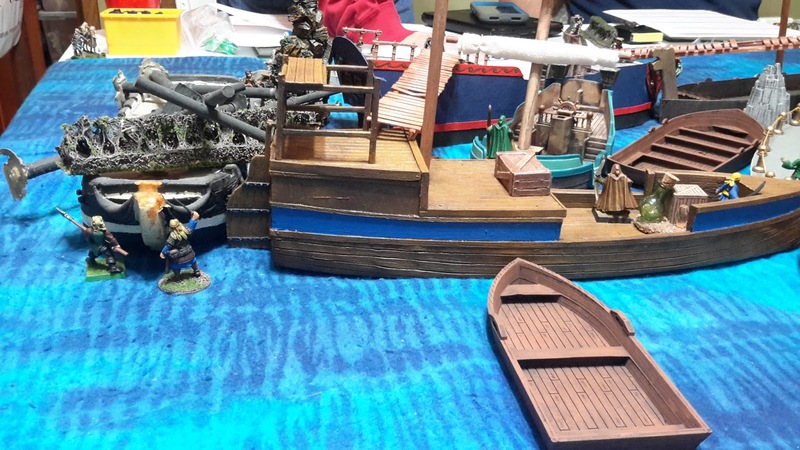 A couple of posts below you will see part one of a battle report that Brian Ivers sent to me with permission to post it here. This article is part two. The table with all the various play aids, including Action Decks, the Activation Deck, and small rubber bands to use as markers during the game. As the enemy draws closer, the type of vehicle is confirmed. The yellow dice represents the number of Hawkins mines on the road, the medallion on the road is the mine field. An explosion beneath the Stug’s left track rocks the tank, wounding the driver and stunning the rest of the crew who bail out. The supporting German infantry fires into the hedges without effect. Hauptman, Ernst Flick, orders his Grenadiers to flank right and calls up the second. Mad Mike opens fire with his support team and sends a principle direction of fire down the hedge. The green dice represents morale hits on the team leader. Buck decides to charge down the road as he knows he can flank the Germans next to the field and he has support, by fire, from Mike. A Stug begins to spray death into the Hedgerow in front of Mike, so he pops smoke. Buck continues his charge. The church signals friendly armor coming from the beach road. Buck can’t see it, but Mad Mike swears and crosses himself in thanks. Corporal Cromer tells the Sgt in the Stuart where the trouble is, and the Stuart heads to the city square. A very nice Sherman follows close behind. It’s getting nasty at the cross roads. Everything the platoon has left is committed. The Stuart rolls into the square and positions itself behind a sand bagged position. There is a mortar team in the M-3 Half track that unloads into the sand bagged position. The Sherman is waived over to the left flank where a MkIV has been spotted. The German commander feels like he is getting the upper hand and wants Lt. Heinrich Schmutz to push. Meanwhile a column of armor approaches from the South: a Puma, a MkIV, and a truck full of infantry. The Puma fires at the Stuarts rear without effect. The Sherman wheels around and fires at the Puma, engulfing it in flames as the crew bails out. The Hanomag pushes across and is missed by the bazooka team trying reaction fire. A .30 cal opens fire from the 2nd floor of the house to the left and almost wipes out the supporting infantry team. The MkIV sees the Sherman rounding the corner and fires, missing it. The Sherman returns fire, and Sgt Oddball scores a hit. The Mk IV loses its right track and is immobile. The crew doesn’t bail, but they are stunned. The Mk IV, seeing the Puma disappear in smoke and fire, steps on the gas to come upon its right side. The Sherman pushes forward to get a better view of the road. The Stug in the meadow supported by the Hanomag is causing a lot of tactical issues for Buck and Mike. Finding that the newly arrived Mortar team was up, Mike uses colorful language towards his runner, who advises the Mortar team to barrage the meadow to Mike’s front. The sweet sound of outgoing mortars punctuates the air as Mike and his team hit the deck. The template covers the Hanomag and the Stug. In Combat Patrol™, indirect fire lands on the Reroll and Reshuffle card. 1 dead, 2 wounded, and a burning halftrack. The Stug is stunned. Buck’s charge kills and wounds the Panzer Grenadiers who are in panic and are pinned as displayed by the black dice. That was the last straw for Strasser. He formalizes a retreat, which was already in progress. The Airborne troopers held. Buck lost 9 men KIA, 12 wounded. The Germans lost 18 KIA over 20 wounded, 1 Mk IV, 1 Stug, 1 Hanomag, and 1 Puma. The object of this game is fun. There are role play elements added. The most important thing is the Random Events table and interaction between teams and players. [I posted Brian’s Random Events tale on Combat Patrol™ Yahoo group.] At any time, the Airborne troopers could pull back and hit again. If allowed to do this, they can play for tactical advantage and usually beat their opponent. Combat Patrol™ is very good and allows for large scale battles even with vehicles. We had up to 4 players on the allied side and I played the Game Master and Germans. This scenario was played over three nights, seven hours total playing time. I hope you enjoyed this After-Action report. This is a reminder to being to prepare your submission for the Battle in a Box contest. Imagine if you will, paratroopers from many different units scattered throughout the Normandy countryside. The full moon overhead is darkened by the shadows of the bocage. The sound of anti-aircraft batteries populates the night air. The constant drone of hundreds of aircraft overhead provides a comforting hum. The sleepy village of St Mere Eglise is fighting a fire near the town square. Its dark: maximum visibility is 6 inches in the bocage and 9 inches along main roads and in the middle of the fields. The Paratroopers can’t see the anti-aircraft batteries, only the flash and sound of their guns. Lt. John “Buck” Surdu has 25 Paratroopers, a machine gun team from the 101stAirborne with three men, and a .30 Cal Machine Gun with 400 rounds, a team from his own platoon, 4 men of the 82nd All American, and apparently all lost in Normandy Divison. Buck has his Platoon Sergeant “Mad Mike” Monagan. There are two other rifle sections of 6 men each from various units of the 82nd Airborne plus a bazooka team. The dice seen in the pictures represent the units’ activation numbers. If a figure is a leader it gets a command die that indicates the unit activates when that card is drawn from the Activation deck. They advance towards the village. They hear anti aircraft batteries peppering their buddies above. The flashes represent the area the fire is coming from. 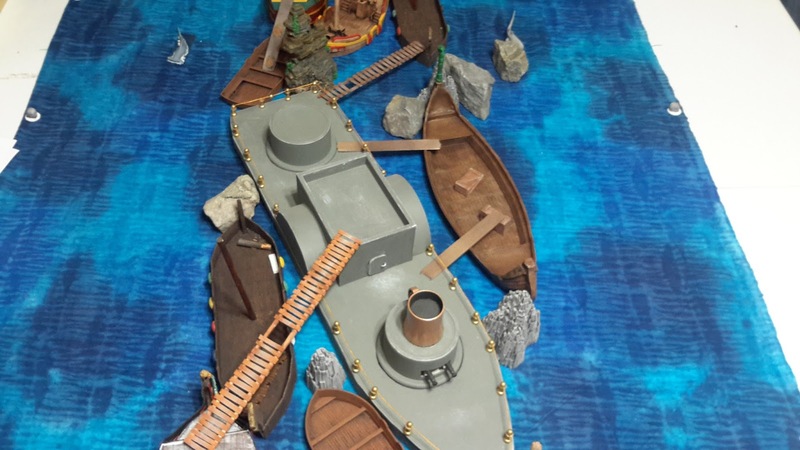 “No animals, real or plastic, were injured during the playing of this battle.” One of the teams lose a Browning Automatic rifleman as they move forward and have to stop to look for him. These random events happen in war, I made a random event table for it. Mad Mike is choking private Jones’ team leader, when Buck interupts his councelling session to deploy the teams for battle. The Americans resume their marching to the sound of the guns and their objective past the cross roads in the city. The anti-aircraft position is up ahead. The plastic orange fire markers indicate general direction the flashes and sound are coming from. The platoon splits once the recon elements discover the Anti-Aircraft positions. One half attacks the Germans on their left of their advance, the other the right. A base of fire with the .30 Cal, Screaming Eagles team covers Buck’s advance towards the preoccupied German AA team. The AA team is rated Green for Guts (morale in Combat Patrol), while the paratroopers are rated Elite. Buck sets up a base of fire, leaving Mad Mike and the 101stguys with a rifle section. Buck pushes forward with the assault element, fixed bayonets, and a bad attitude. “Mr. hand grenade is your friend.” Training came in handy as the paratroopers rain grenades on the unsuspecting Germans. The plastic overlay indicates the grenade blast radius. Cards are flipped, and casualties assessed. One German dies as he is thrown on the grenade by his courageous buddy. Another is wounded, and all are concussed except two outside the cone. The different elastic bands indicate wounds and morale condition. Tipped over figures indicate dead/incapacitated Germans. Buck cleans up the bad guys in the AA pit and pulls his support element forward. The paratroopers set up another assault and push into the second AA battery. Cromer’s team lays down suppressive fire as Sgt Andy Krieg’s team rushes to the second AA position. With fixed bayonets and no serious adult supervision, the teenage paratroopers close with the enemy who have been killing their buddies in the air. Corporal Sanders gets a bullet in the throat going into the bunker and dies with his bayonet embedded in the chest of the man who shot him. The German AA garrison is alerted, and men begin to come out of their quarters to assist their comrades. An arial shot shows the two AA positions and relative advances of the two teams. It’s all over. The AA crew lies motionless, their weapon silenced. A fierce hand-to-hand took place, but trained elite infantry will usually defeat untrained artillerymen. The paratroopers must press on. There is a hidden team inside the town who had dropped with F Company where most had been killed or captured. They make their presence known to Sgt Krieg as he occupies the wall across from the road. The team has almost no ammo but a nice .30 cal. Buck has a determined counter attack heading towards him. The counter attack is broken up by concentrated fire. Enfilade fire from Cpl Cromer’s team in the sand bagged position and Buck’s forward element firing from behind the cover of a hedgerow. The Germans await the paratroopers in the town. The German garrison has no idea how many or what kind of support the Americans have, which is good news for Buck, Mad Mike, and Sgt Krieg’s’ teams. Two groups of paratroopers occupy the road before the town. The Americans have 5 wounded, two dead, and another guy who went missing. Corporal Dubois from Church Point, Louisiana, said, “They are saying ‘don’t shoot.’” It’s a family, and they say the house is empty, but the boche are in the houses across from them. The bazooka team, led by “Lumberjack” Hansen, begins to shoot holes in the house to support Buck’s advance. Buck and his troopers move towards the house. The Germans are stunned and begin to withdraw from the town. The Germans take casualties and are ready to scram as their morale is low and casualties high. The team that pushed across the road took 2 dead and 1 wounded. The lower floor opened up on them just after the bazooka round impacted. The objective is taken, but can they hold? Buck organizes the defense of the town. He places teams in the church tower and places teams in the buildings near the cross roads. It’s getting light. The 101st team runs into the destroyed house while their brothers attached to the 82nd begin to feed their MG and mow down the supporting grenadiers of the Puma armored car. The machine gun “processes” the advancing Germans. The Puma can’t see the fire from the church tower, so hoses down the buildings in front of him, wounding a Screaming Eagle and killing an All American. The German grenadiers are caught in a cross fire and are cut to pieces. The Puma begins to pull back. The battle will continue. Waiting for the Sherman’s to give us a “very nice edge.” To be continued…. The game system is Combat Patrol™: World War II. The action is generated by cards drawn for each side. 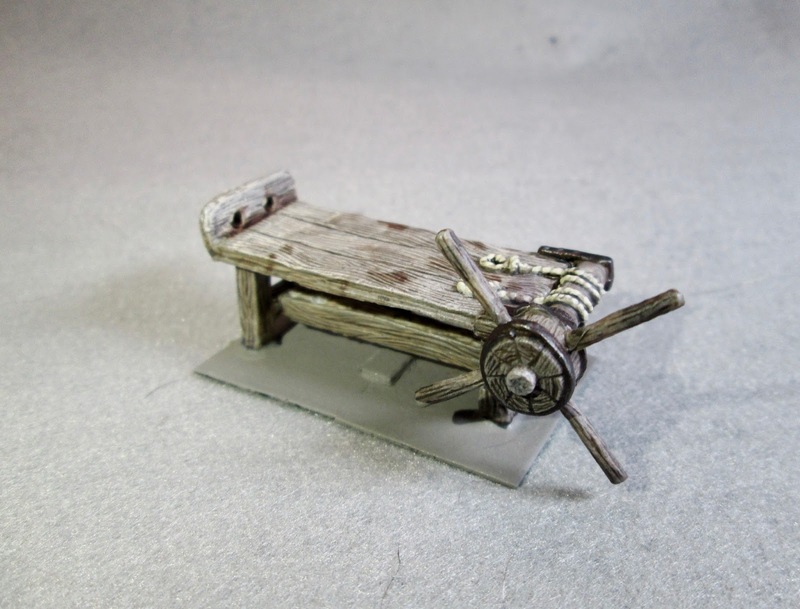 This produces movement morale, casualties, etc. 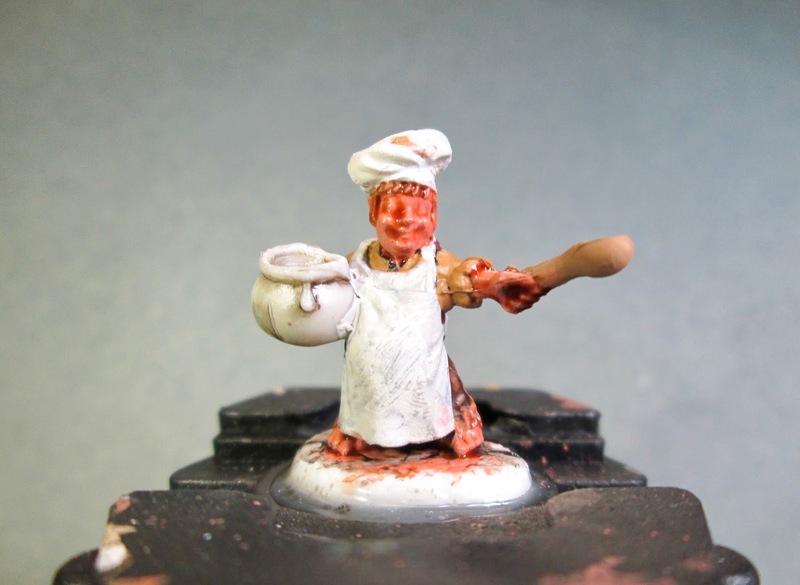 The models are Flames of War. The buildings are a mix of 4Ground. E-plastic, and Flames of War prebuilt. The trees and hedges are from kits and scratch-built railway hobby parts. We have 4 people playing, and I am the Game Master. This plays quickly and has a lot of role play elements to it. The mat on the table is for ease of movement and is GMT product from Command Colors. 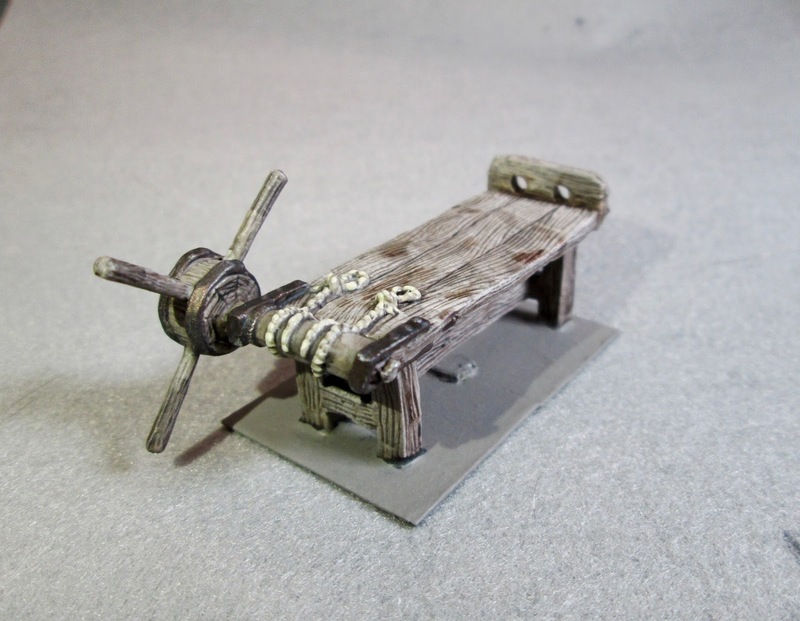 It was another busy week this past week, so I selected the last piece from the Bones 3 Torture Chamber set to paint. I prepped the pieces of the figure in the usual way; soaking them in a dish of water with a couple drops of dish-soap added, then giving them a light scrub with a soft toothbrush, and then rinsing and drying them. I then assembled the rack with Gorilla superglue gel. 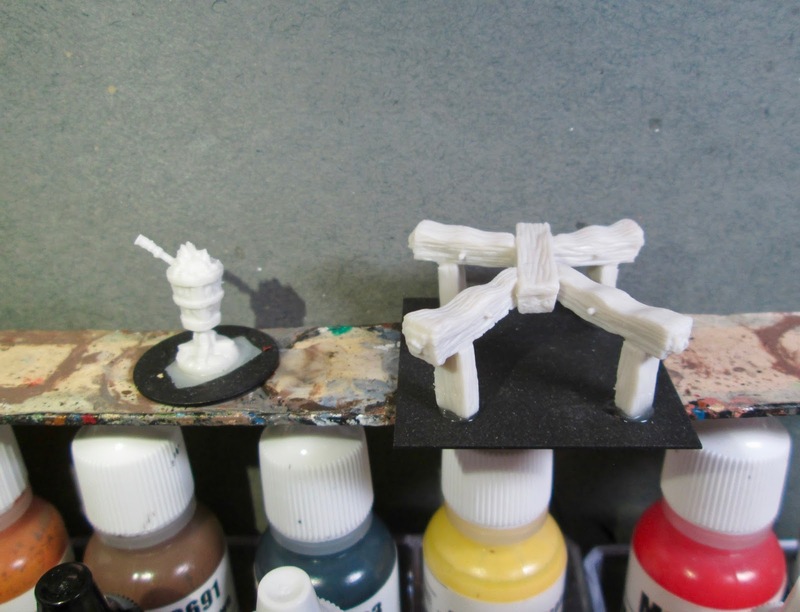 When the glue had set, I glued the rack to a pair of primed 1"x 1" steel bases with Aleene’s Tacky glue (I would have just used a 2" x 1", but I didn’t have one. ), and then glued the mounted figure to a tongue depressor with a couple drops of Elmer’s glue. I began by painting the whole thing with Americana “Neutral Grey”. 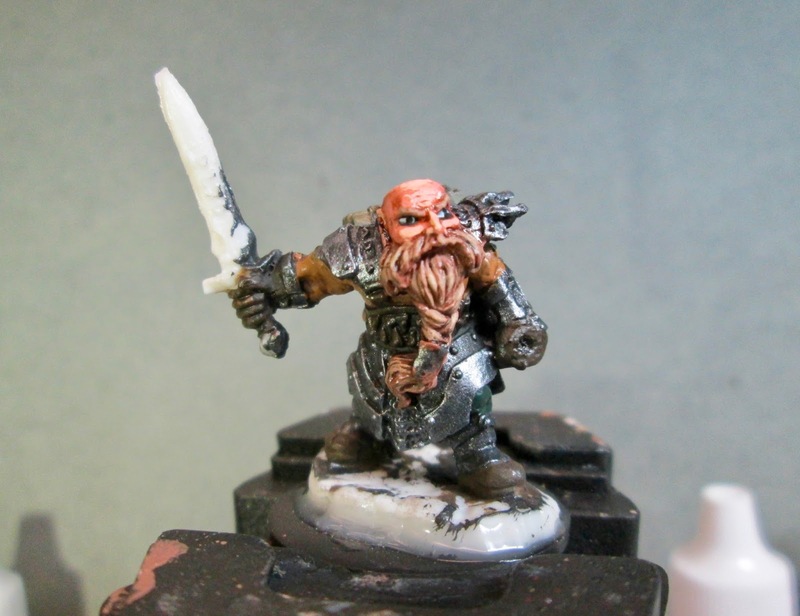 When that dried, I gave the whole piece a wash with Citadel “Agrax Earthshade” wash. When the wash was dry, I drybrushed the whole thing with Folk Art “Barn Wood”. Next, I painted the ropes with Folk Art “Porcelain White”, and the metal fittings with Reaper MSP “Scorched Metal”. 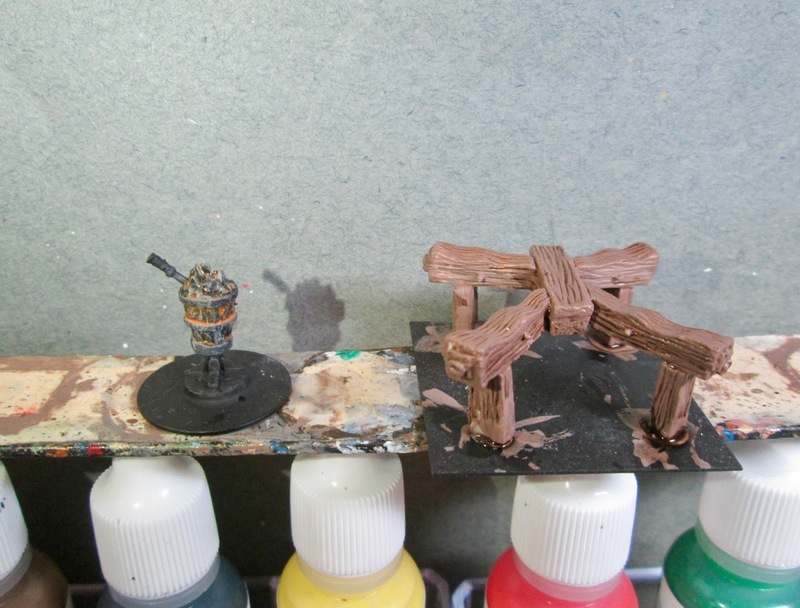 I let everything dry for a bit again, and then gave the rope and the metal bits a wash with Citadel “Nuln Oil” wash. 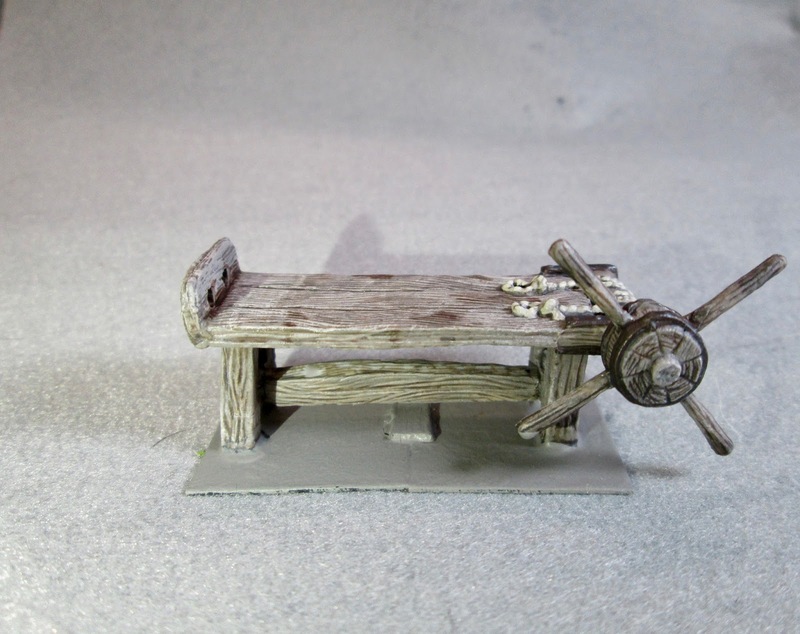 When the wash was dry, I highlighted the rope with the base “Porcelain White”, and I highlighted the metal with Folk Art Metallics “Gunmetal Grey”. After that I dabbed on some Winsor Newton"Peat Brown" Ink here and there on the table to look like assorted stains. 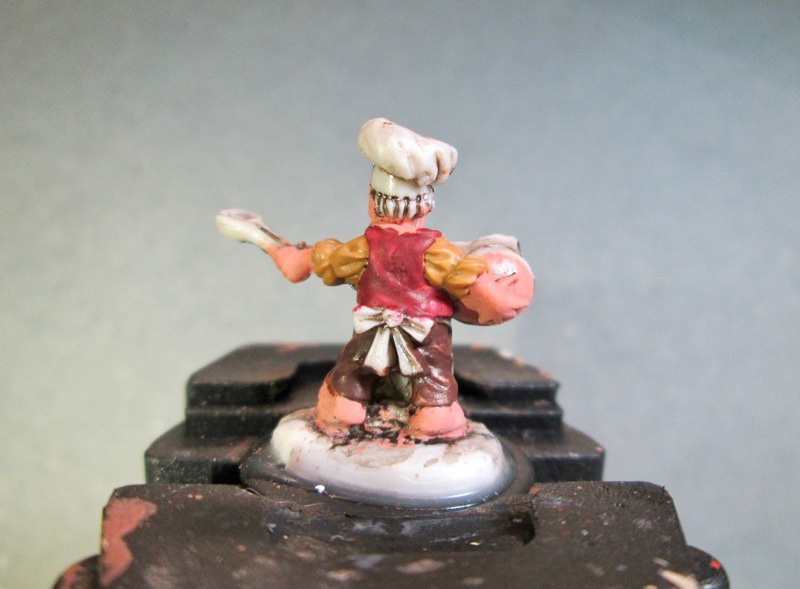 I also put a little of the “Nuln Oil” on the wheel spokes to look like stains from constant hand contact. 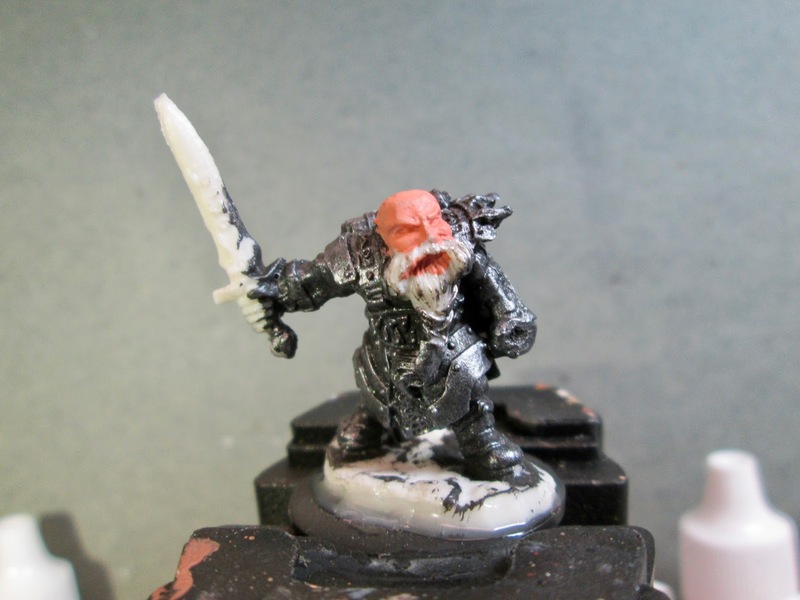 Lastly, I painted the base with the “NeutralGrey”. I’m really happy with this one. I think the aged wood looks just right, and the addition of the staining adds a nice touch of authenticity. 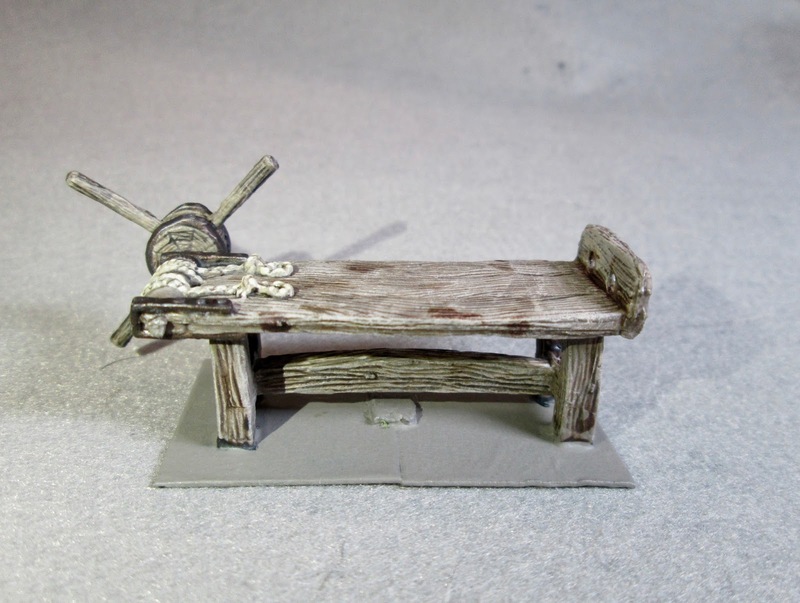 This past week, because I was getting over a cold, and it was Easter weekend, I selected something relatively easy and quick to paint; the X-rack and Hot Iron from the Bones 3 Torture Chamber set. I prepped the figures in the usual way; soaking them in a dish of water with a couple drops of dish-soap added and then rinsing and drying. I then glued the X-rack to a primed 1.5" square steel base with Aleene’s Tacky glue, and the Hot Iron brazier to a 7/8" black-primed fender washer. I then glued the figures to a tongue depressor with a couple drops of the Elmer’s glue. I began by painting the Brazier Ceramcoat “Black”, and the X-rack with Americana “Mississippi Mud”. I then drybrushed the Brazier with Folk Art “Medium Grey” followed by Crafter’s Acrylic “Storm Cloud Grey”. 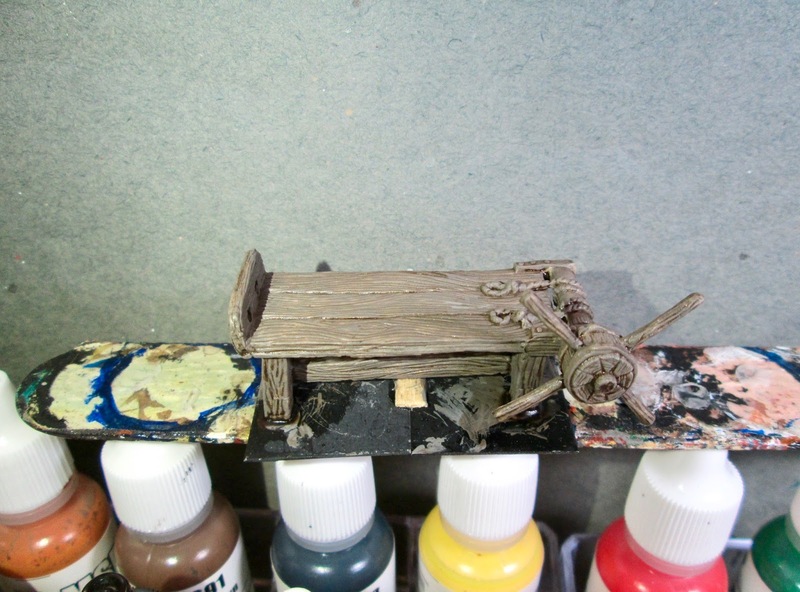 I moved then back to the X-rack, and gave it a wash with Citadel “Agrax Earthshade” wash. When I was done applying the wash, I went back to the Brazier, and gave the coals a light wash with some thinned Iron Wind Metals “Orange” Ink to hopefully make them look like they had a heat glow. 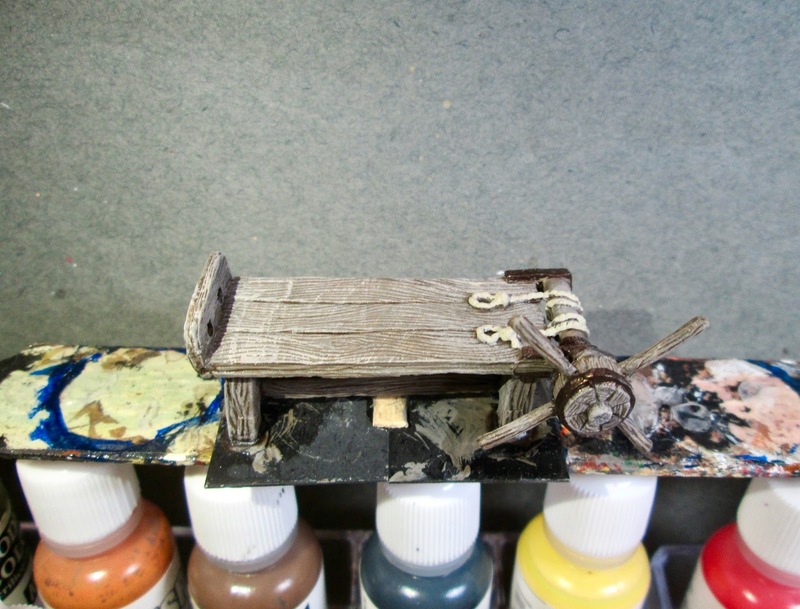 When the “Orange” ink and the “Agrax Earthshade" wash were dry, I drybrushed the X-rack with some Folk Art "Barn Wood”. 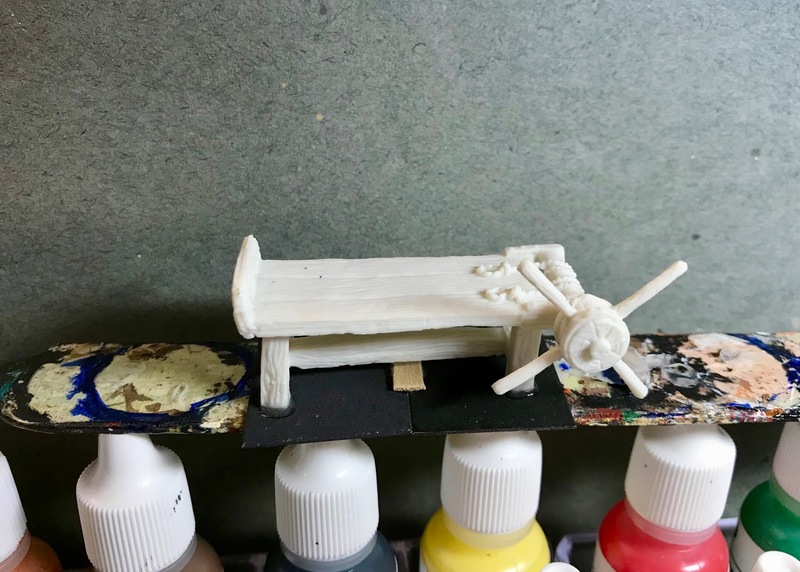 I then painted the Brazier itself , and the little bit of the poker sticking out, along with the fittings on the X-rack, with Reaper MSP “Scorched Metal”. 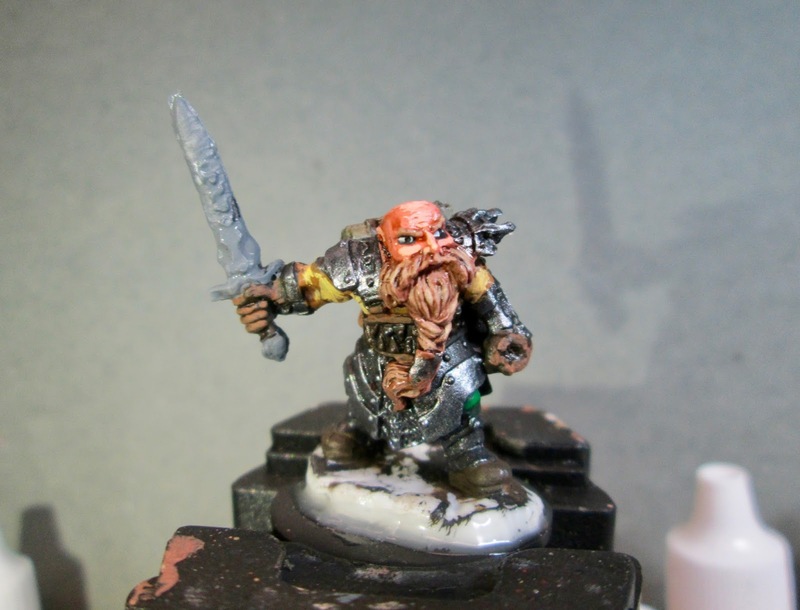 After the “Scorched Metal” had time to dry, I applied a little Citadel “Nuln Oil” wash to the “Scorched Metal”. When that was dry, I hit the fittings on the X-rack with some thinned Accent “Golden Oxide” to try to give them a little rusty appearance. 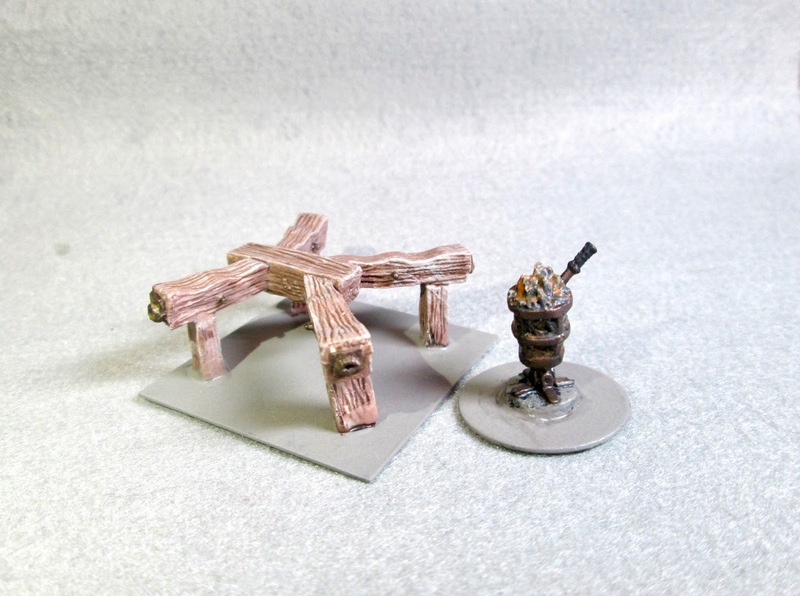 Lastly, I painted the bases with Americana “Neutral Grey”, then when it was dry, I gave the carved rocks under the Brazier a little dab with some of the “Nuln Oil” to help accent the crevices between them. I let the pieces dry overnight and the next day I gave them a coat of Americana “DuraClear Matte” varnish. Then, another overnight dry, and I sprayed them with Testor’s Dullcote". Well, they’re very nice. Nothing exciting; but they’re done, and thats a good thing.